Discussion in 'BushClass USA' started by IA Woodsman, Oct 23, 2012. Timely task as this job needed doing. It was a seriously blunt axe head thats around 60 years old. 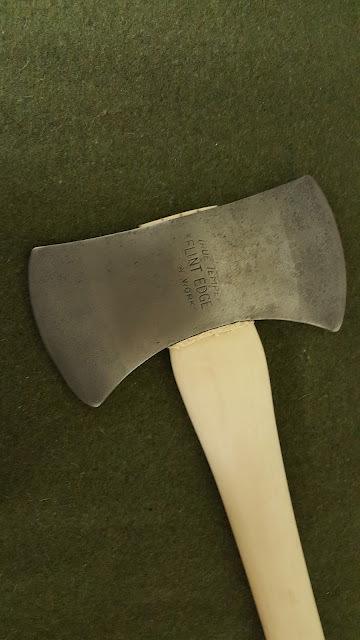 So after a good resharpen I fitted the head to a new handle. 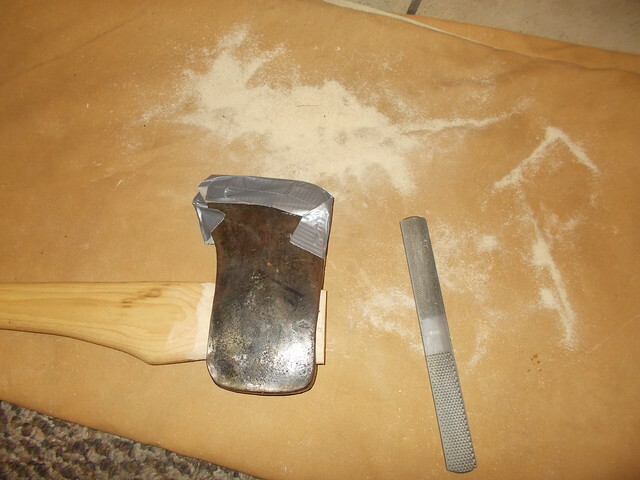 After I checked the head is tight by chopping some wood, I will soak the axe and handle to expand the wood. Allow it to dry but not bone dry and oil it thoroughly. Dry wood shatters. 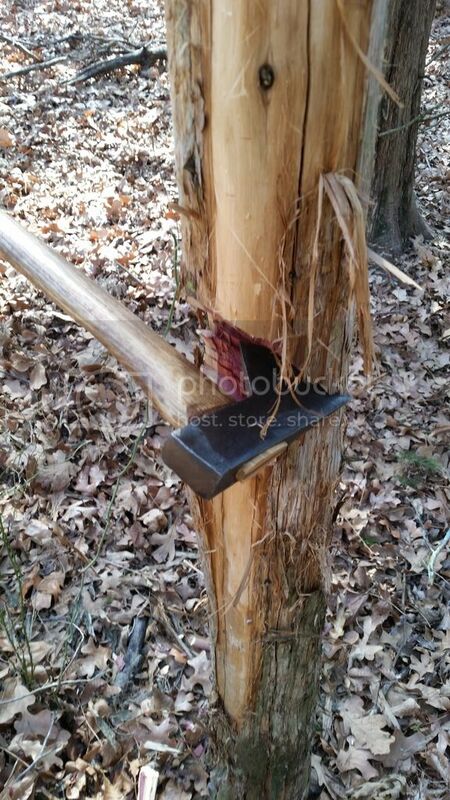 Not good for axe handles! Just my thoughts. Medicine maker, OMRebel and Sgt. Mac like this. 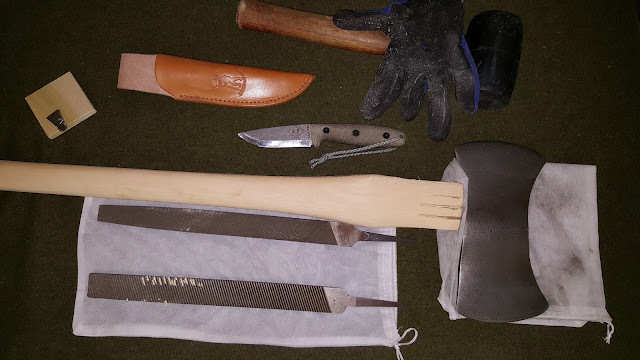 I had a small hatchet head (1.33 pounds) around the shop and wanted to make a small axe to carry with me in my pack. Something like the GB small forest axe (head weight about 1.5 pounds and 20 inches long. Medicine maker, AK Adventurer, Keyser Söze and 1 other person like this. Handle fitted in head, wedge next. 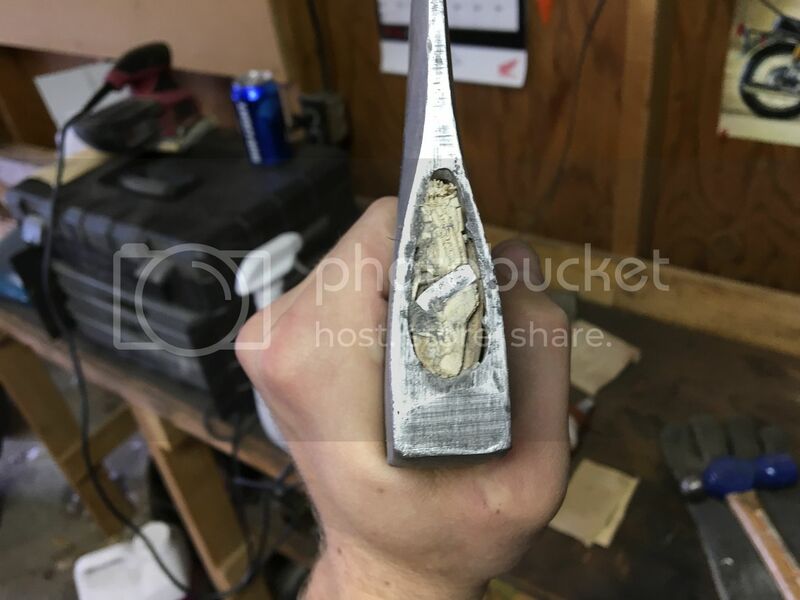 Wedge got a little messed up going in but still did the job. Got er very sharp. Chops well. I learned a lot. This was my first attempt at hanging any tool. It came out really well but could have definitely been improved in certain areas. So i finally got my axe head hung! 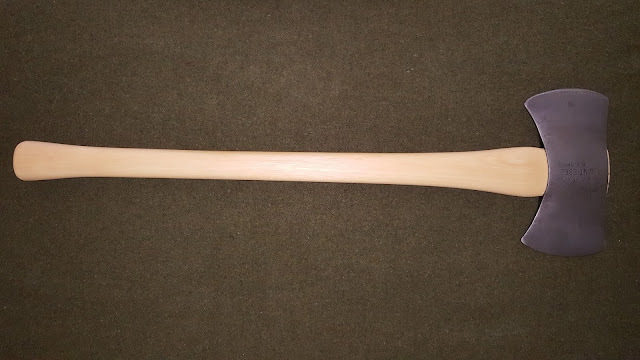 Kulkoni Inc. Axe. Worth my time?? And Prior to hanging the head i knocked all the rust off and started shaping it but looks like a i need some new files to really get a nice grind on it. i beat it in until my homemade mallet fell apart haha. and now multiple soakings of BLO until she is fat and happy with it! 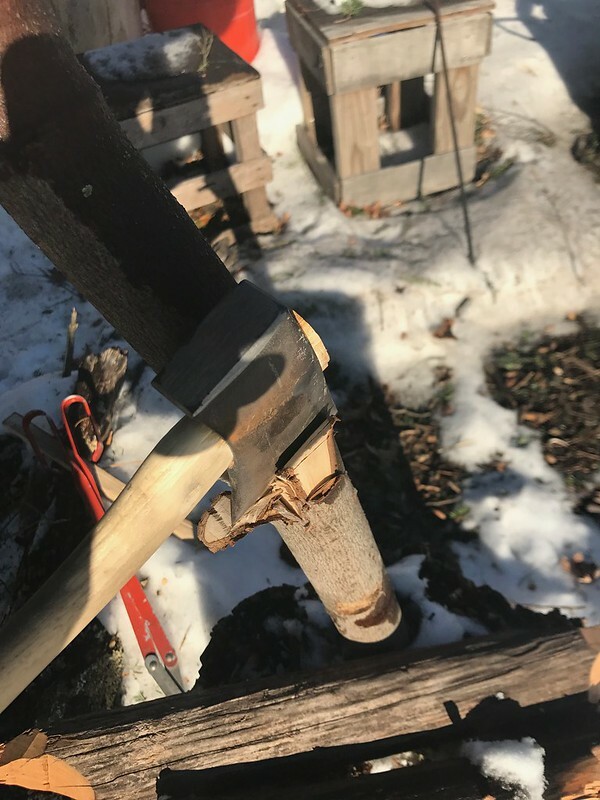 Its still not quite shaped great enough or sharp enough but for the lesson i took it outside and beat on a old log i had laying around to chop it up a bit! AK Adventurer, Pastor Chris and Sgt. Mac like this. Handle is a 28" Link, it's all I could find locally. Head is a Norlund Hudson Bay pattern. Old next to new. Lacquer stripped. 2 coats of vinegaroon, sanded after each. 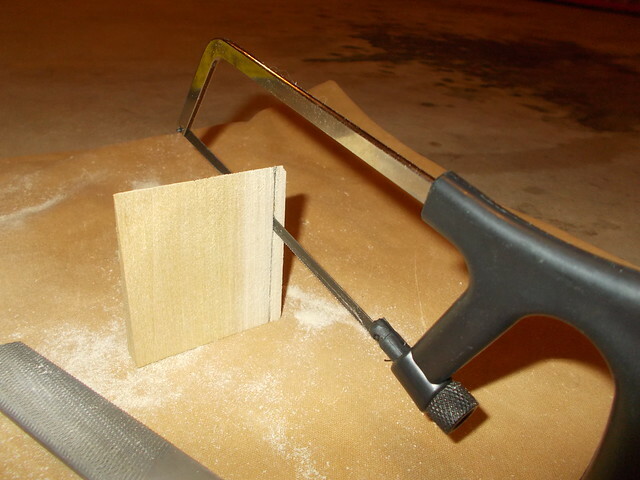 Wedge in, excess cut off, sanded smooth. From the side. Left about 1/2" to make sure the head stayed in place. That's what the problem was with the old handle. ETA:. Work pictures!! Dead standing cedar. Tom Eickenberg, mainewoods and Sgt. Mac like this. AK Adventurer and Sgt. Mac like this. Finished hanging the beveled Norlund, now just need to sharpen it. 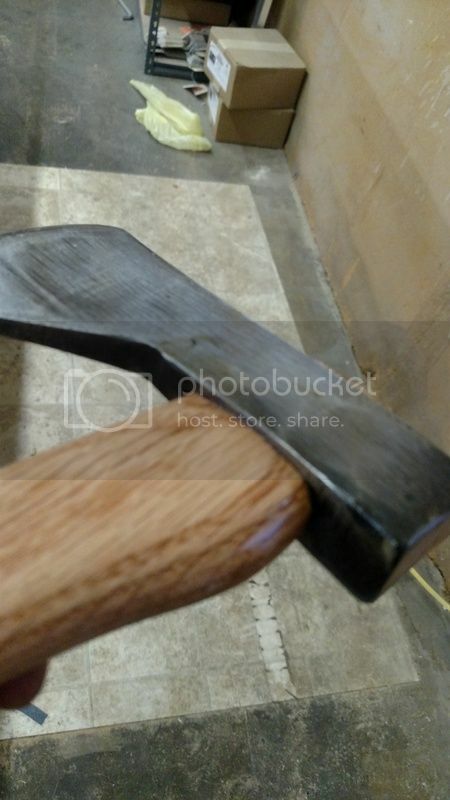 36" House Handle, Bog oak wedge. Head weighed 3lb 7.6oz. AK Adventurer, Derzis, gus1911 and 2 others like this. I have been catching up with restoring my family's hand tools and recently got around to hanging my grandfather's no name double bit. 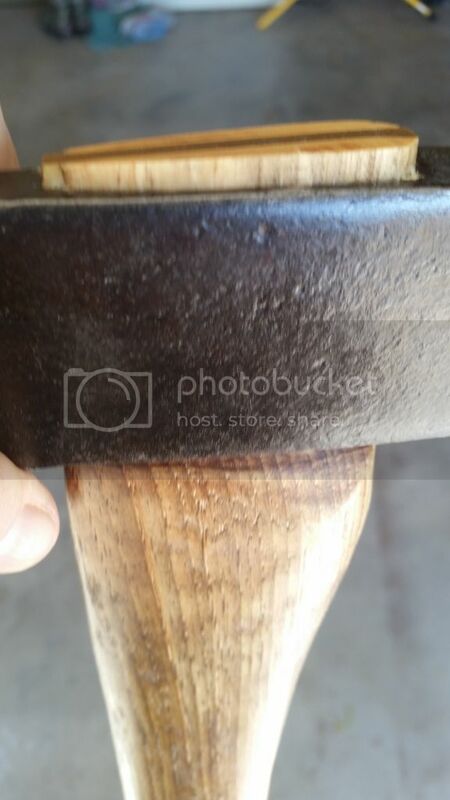 Started out by removing the varnish from a new handle. Bottomed out a bit early. 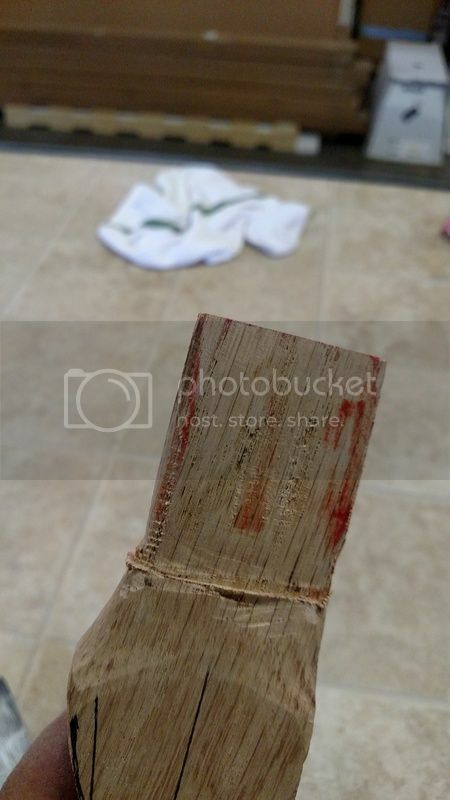 I split the wood with the metal wedge. I hate that. Striking looks to the handle. We'll see if she chops. Medicine maker, AK Adventurer, Sgt. Mac and 1 other person like this. 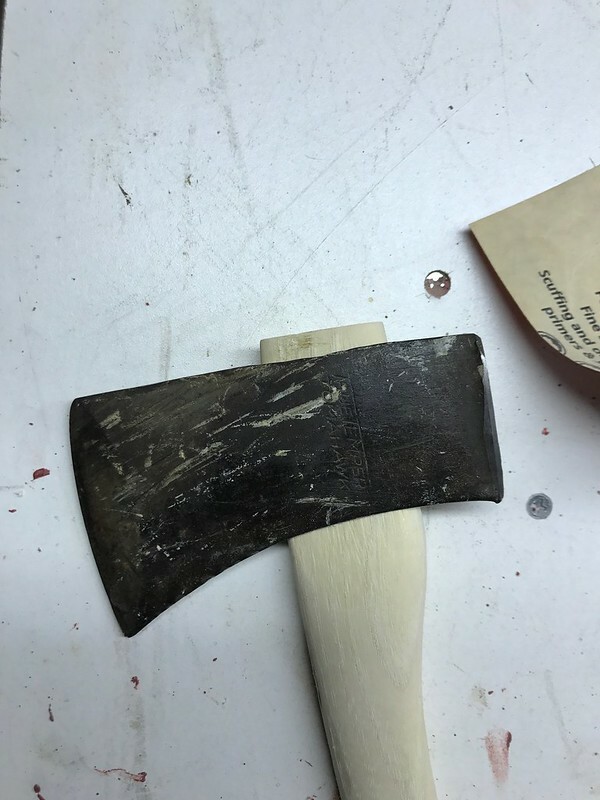 I've wanted to make a custom mini hatchet with a handmade handle. I also picked up a dead standing branch of Rata from our house. Rata is a stunning, slow growing vine/tree with dense wood a gorgeous red flowers. 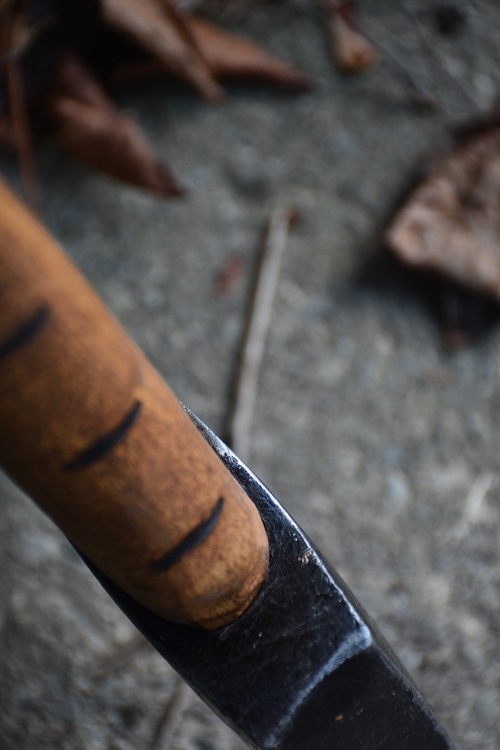 The branch of Rata had a natural bend in it that I wanted to work into the handle. 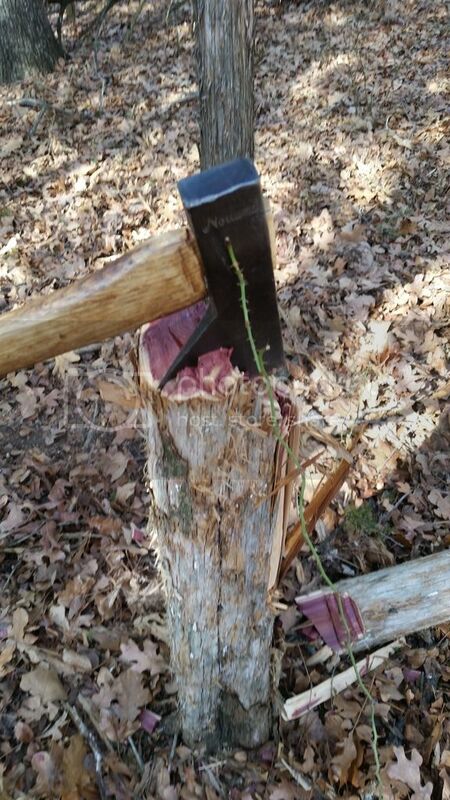 After cutting the branch to length I split the sides of by batoning the axehead through. This accidentally took a deep gouge out of the prospective handle. Keen to use only hand tools for the handle I started shaping with a rasp and at times a knife. The wood was very hard but beautiful to work with. I tried to incorporate the bark of the tree into the back of the handle, it ended up with a small 2 inch section on the bend. After rough outlining the handle shaped I fitted the eye with lots of slow trial and shaping. I found the eye was larger at the top so once I had shaped the haft to fit, it left a bit of space near the top. 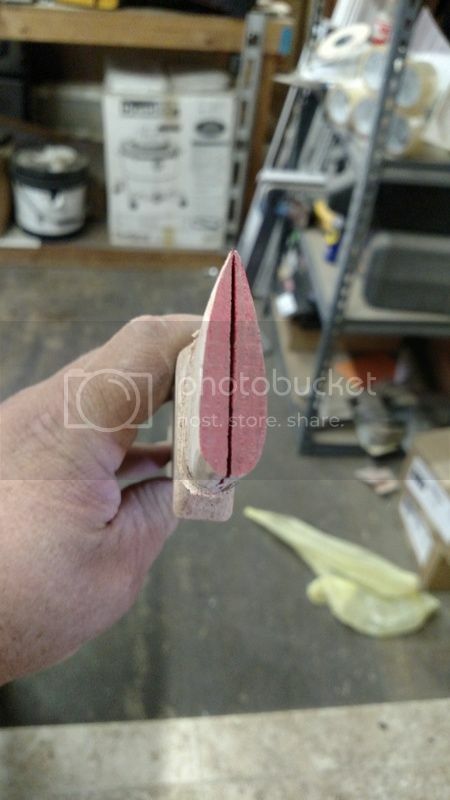 I cut a contrasting red hardwood wedge that I made to the full length of the eye. A bit frustrated that it ended up with a gap at the top. I think I'd try a slightly thicker wedge next time. The finished article. Now to put a finish of Danish oil on it (wait for ages for it to dry) and do some chopping. 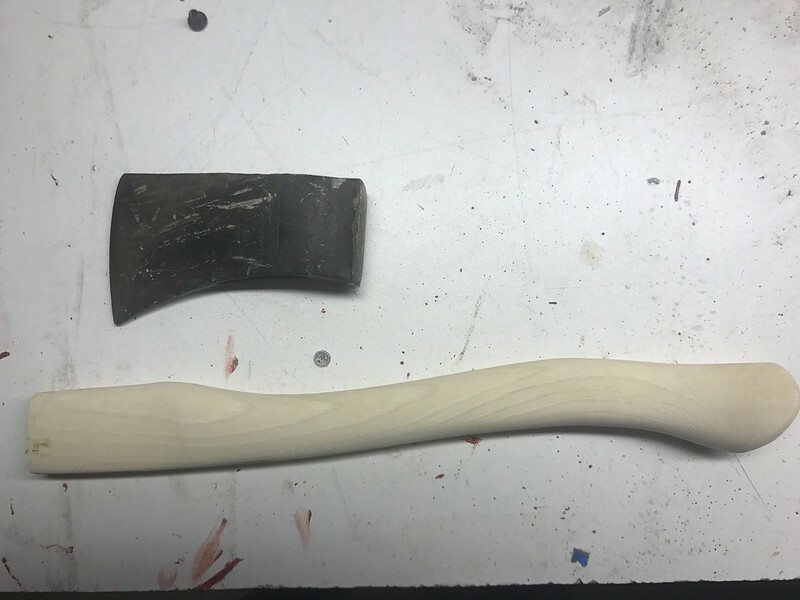 This is my first axe handle so any suggestions, critiques, advice warmly welcomed. Oil finish finally dry, I got out and split some kindling this afternoon. Splits wood fine and chops OK, think it will be handy in shaping other projects out too. 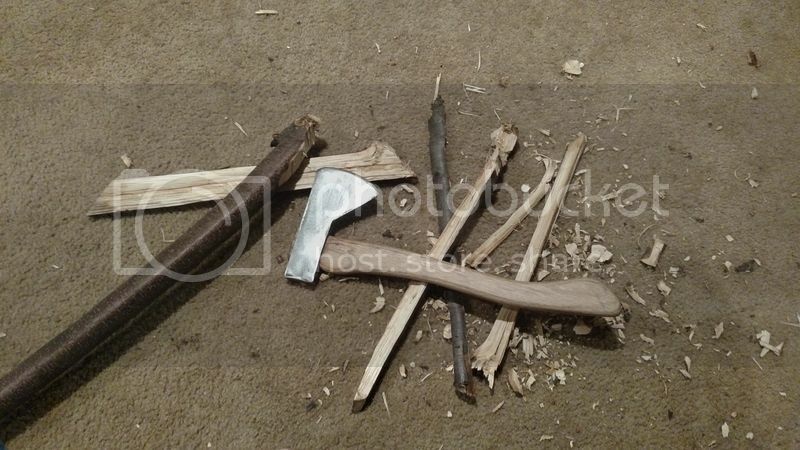 I made some shavings to get this fire started but I think the axe needs to be sharper to really shave well. 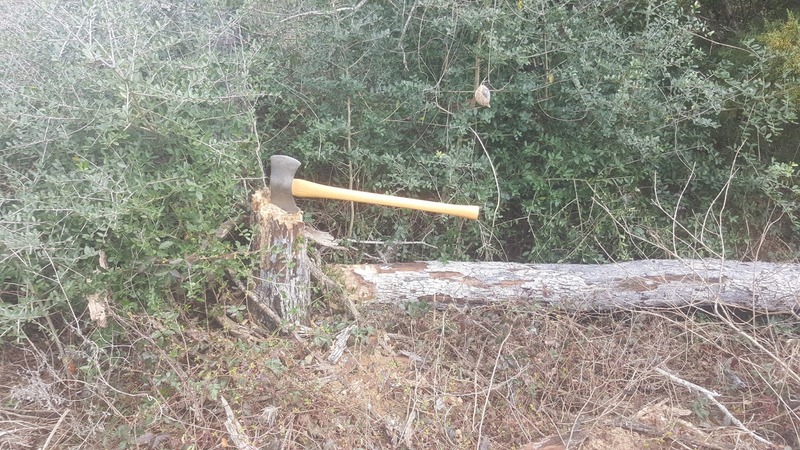 How sharp do you recommend having an axe this size? AK Adventurer, NevadaBlue, Keyser Söze and 1 other person like this. Couldn't find a handle locally that would work. All I could come up with was a plank of red oak from home depot. Rough shape cut out and start of shaping for the eye. put some red paint inside the eye to make marks where I needed to trim things up. Wedge and handle oiled well. Ready for the wedge to go in. BLO all around and done. Crazy storm outside, so I had to do this in the living room. Don't know what kind of wood this is (tree in my front yard that I can't ID) but it's tough stuff. Tom Eickenberg, Medicine maker, AK Adventurer and 2 others like this. I've had this head for 16 yrs now and 13 of them it hasn't had a handle. It's sat above my work bench since I moved into the house I live in now. I took a sander to it and knocked off all the paint. Rerouted the blade. Forgive Mt terminology if I don't get it right. 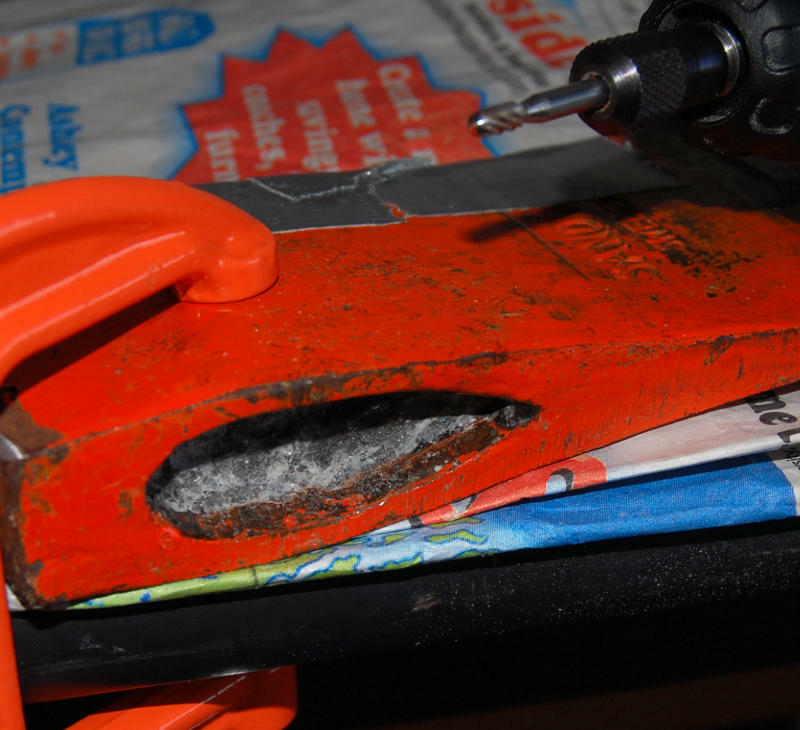 A re-ground the blade and and at the end of it pulled an edge with a smith's carbide course sharpener. 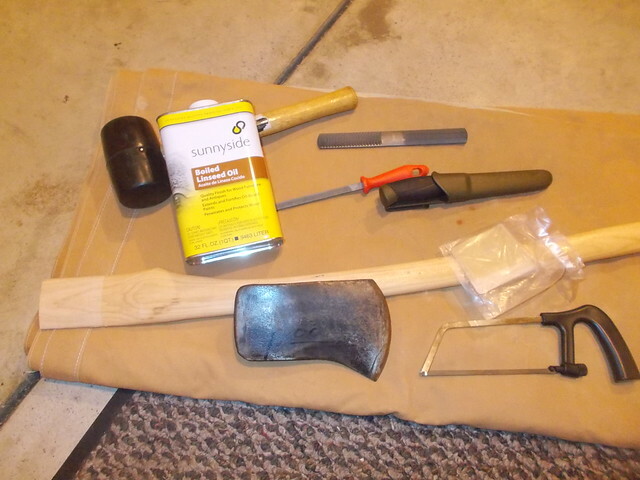 These are the tools I was working with. The head is a 3 1/2 pound Germany reliable. 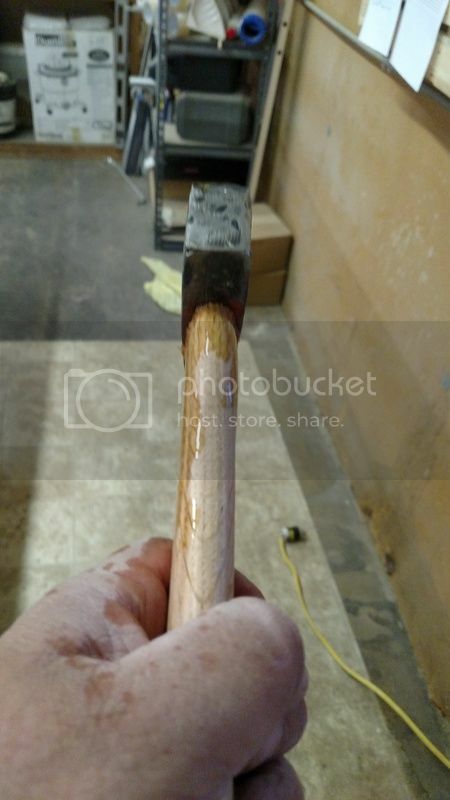 The replacement handle is a 26in hickory. It took a lot of sanding and shaping to pull a decent fit. Still couldn't get 100% what I wanted. Oiled, hammered, trimmed the extra and metal pinned it. I remember being a bad aim ad a kid so I figured a little protection couldn't hurt. After 14 halfhearted swings because I didn't want to hurt my new baby. After gaining a little confidence 8 popped it in two. This has given me a new found respect for my tools. Before I would have gone and bought a new axe but this is an extension of me now, something to be proud of. I hope this counts. We can do electives in any order with the basic lessons, correct? 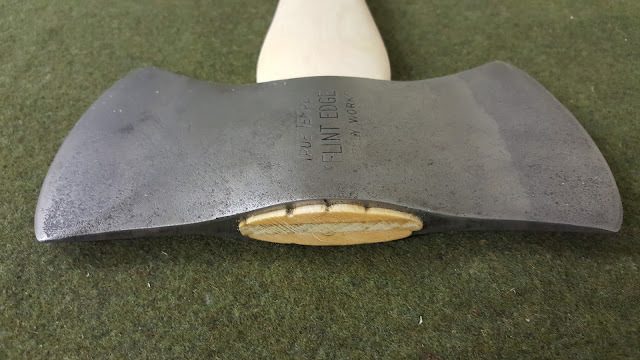 I hafted an axe head I bought off ebay last December on a whim... before I really gave much thought to doing these lessons. I detailed the process here. This was a challenge because I live in an apartment (no shop or garage to work in) and only have very basic hand tools. Tom Eickenberg, Medicine maker, AK Adventurer and 1 other person like this. This is the first time I've done this type of work. It turned out nice, and I learned a whole lot doing the project. AK Adventurer, Keyser Söze and Sgt. Mac like this. 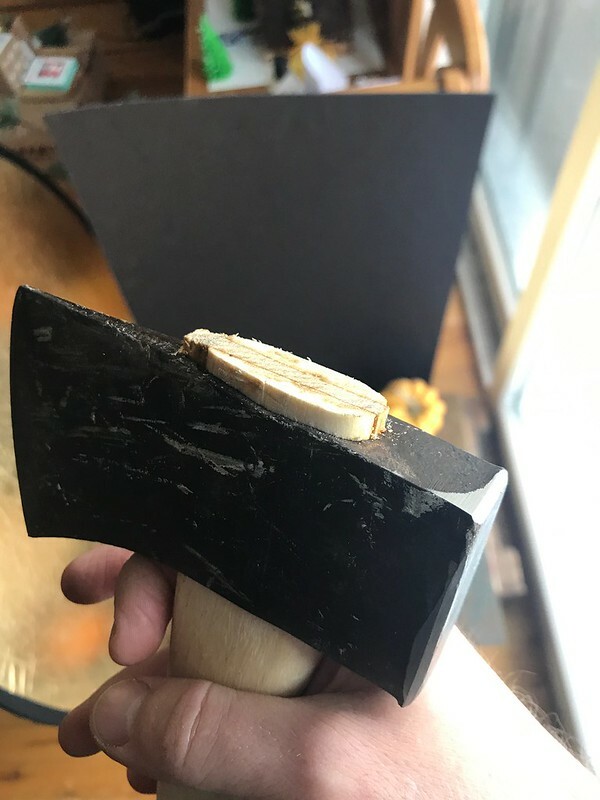 Turned out better than I thought it would.Thanks for a great lesson and also thanks to @sons of scotland for giving me this axe head a few years ago. AK Adventurer, Keyser Söze, sons of scotland and 1 other person like this. 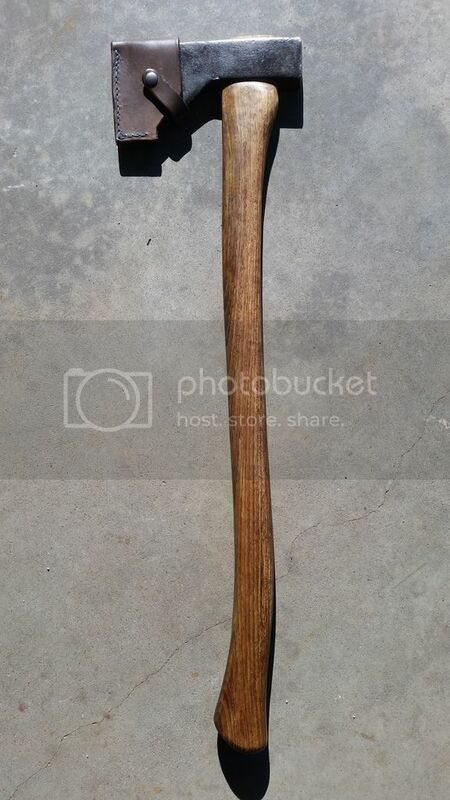 It is hard to find the right sized handle because this ax is so small. So I carved one from a hickory board. The eye of the ax is different than most. It is made by drilling 3 holes side by side with a tapered reamer. 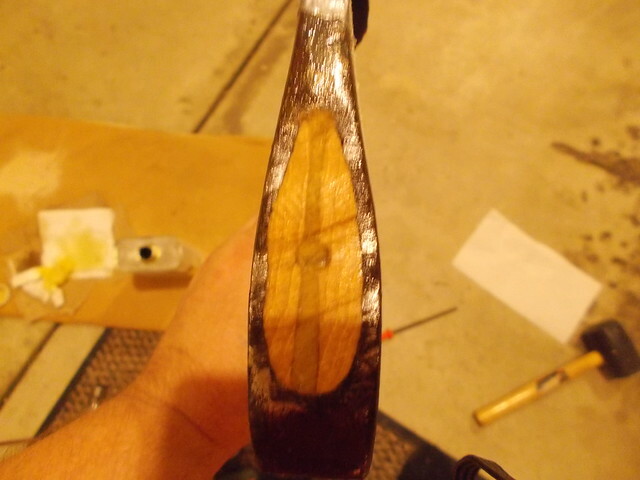 I mostly used a gouge to carve the neck of the handle so it would fit the eye. 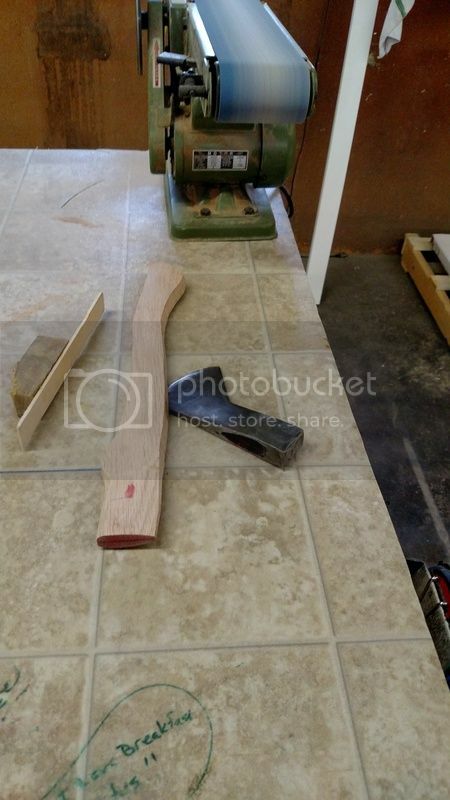 Here the handle is shaped, the neck is fitted, and the handle is stained. 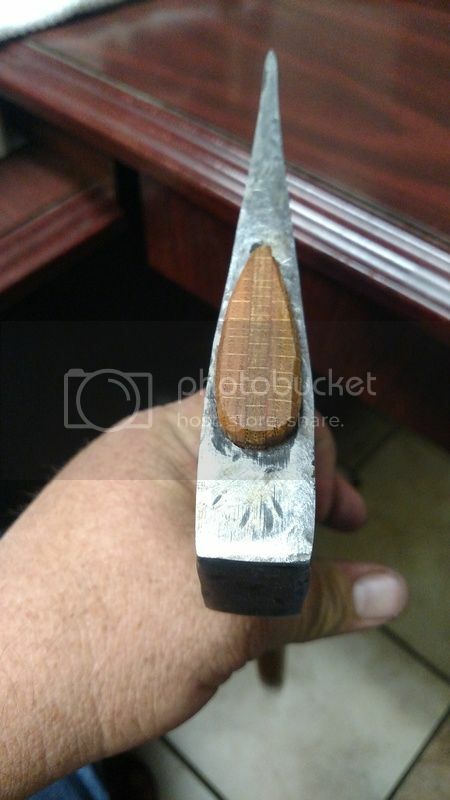 The first wedge I fit wasn't thick enough to spread the top of the handle apart and fill the eye because marbles used a tapered reamer and the top 1/2 of they eye flares out more than most axes. 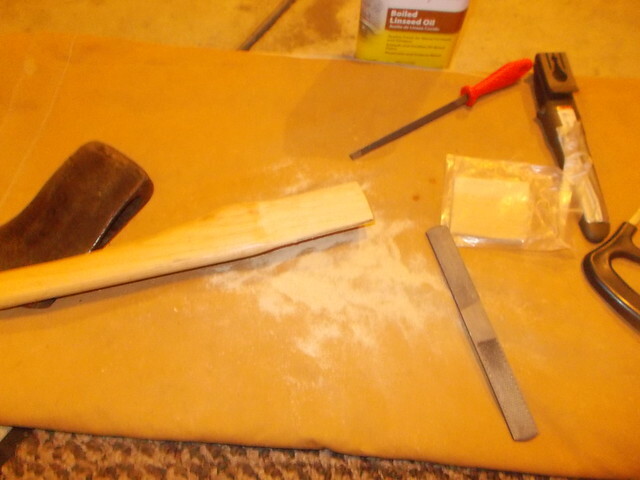 I drilled out the 1st wedge, and made a 2nd thicker wedge. Second wedge started. Second wedge bottomed out. Handle has a tighter fit with the wider wedge. I soaked the head in linseed oil over night as well. Tom Eickenberg, AK Adventurer, Kelly W and 2 others like this. Love the marbles. Nice job on the hafting. Looks just like mine only my little axe only has 2 holes in the eye. 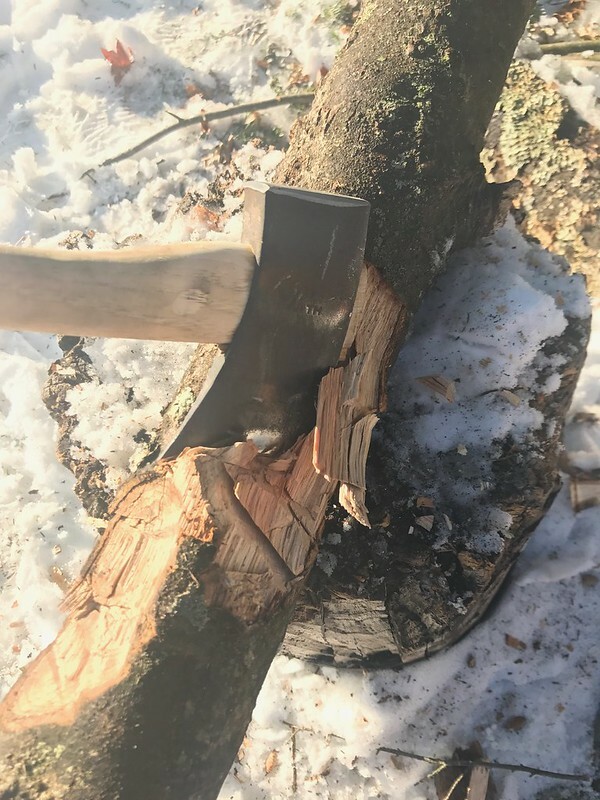 My bad, i thought electives was for intermediate cert..
Last Friday i found a nice hickory tree that had fallen in a storm and cut a big chunk from it. 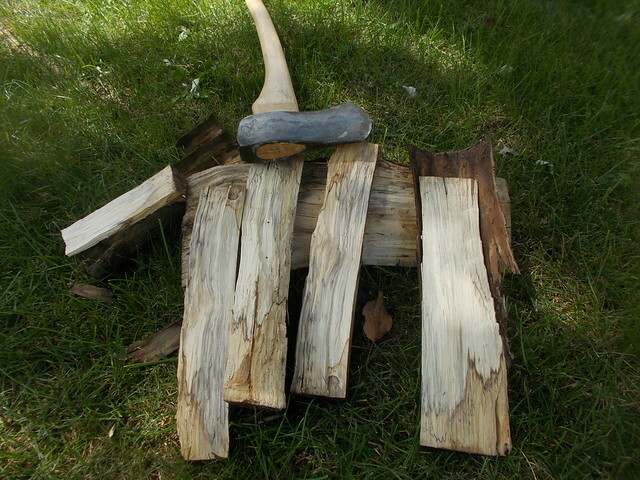 Split it down and used that to practice making a couple axe handles since the one i made previously from an ash sapling was a complete failure. I fit it, used it for a few days and ended up knocking the wedge out because the ears we're digging into the handle and i had to round them off for a better fit. I drove it down lower on the handle until it was perfectly snug. Wedged it, slammed a circular metal wedge in the center. 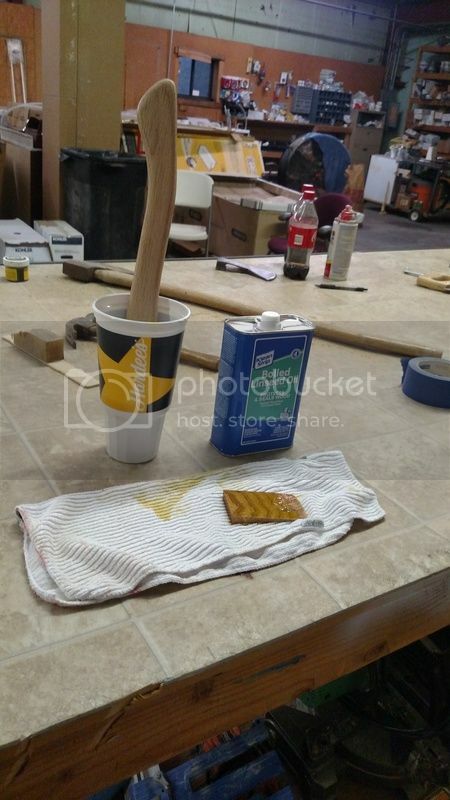 Soaked it in motor oil, stained it and put a wax finish on the handle. Works great now but i think i can do better. 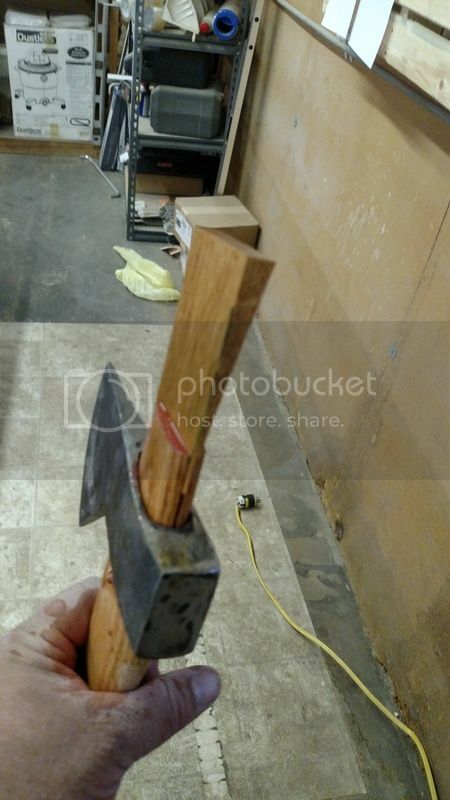 Ok, I had this hatchet head and wanted to make my own handle for it. Unfortunately I also wanted to use it on my next outing. 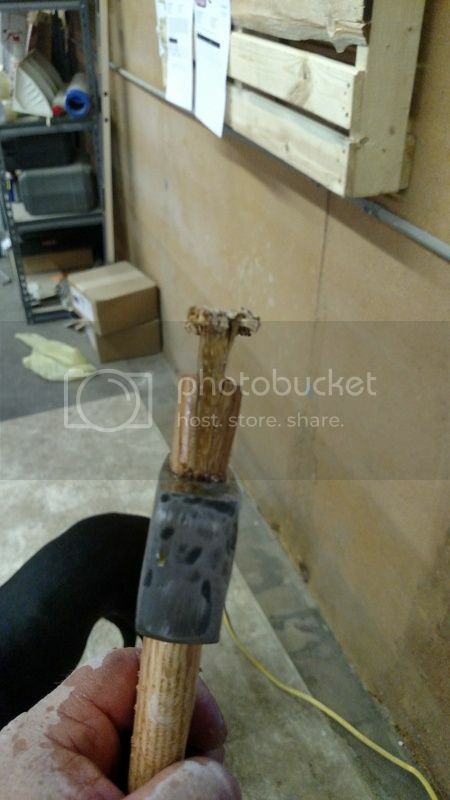 I'm not going to be able to get material to make a handle from scratch so in the mean time I grabbed a hardware store handle to get the head into service. Here are the materials ready to go. 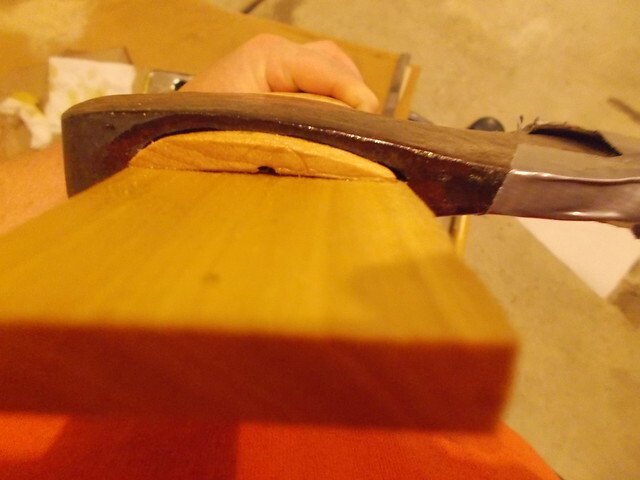 It took a bit of work to thin it out enough for the head to fit well but the spoke shave and draw knife worked well. Now that the head fit well I used just a regular hammer to tap the handle bottom and set the head. It seated nicely leaving little hickory curls to trim off. 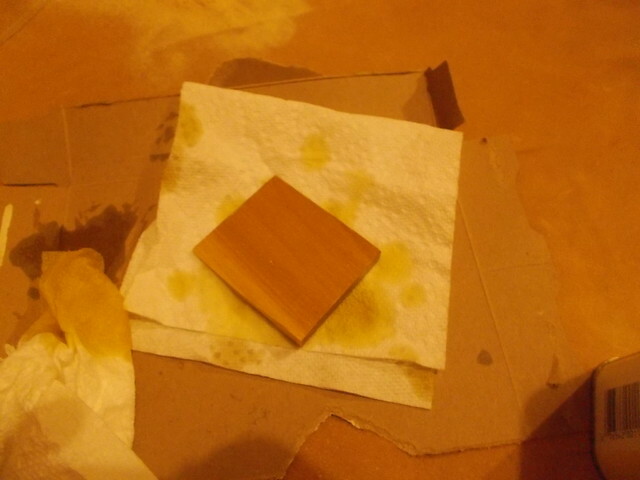 Next I trimmed off some of the excess above the head and got the wedge soaking in some BLO. All started and ready to drive home. The wedge drove home nicely. I was hoping to leave everything fitting a little proud to lock it all in. Unfortunately it spit apart and made quite a mess. The eye filled well and I expect to replace the handle though so I trimmed it flush instead. For the chopping test there was a downed maple branch in the yard. Took a few chips at it and nothing loosened up! A little more sanding, some oil, and a final sharpening and she will be good to go!! Tom Eickenberg, AK Adventurer and Sgt. Mac like this. 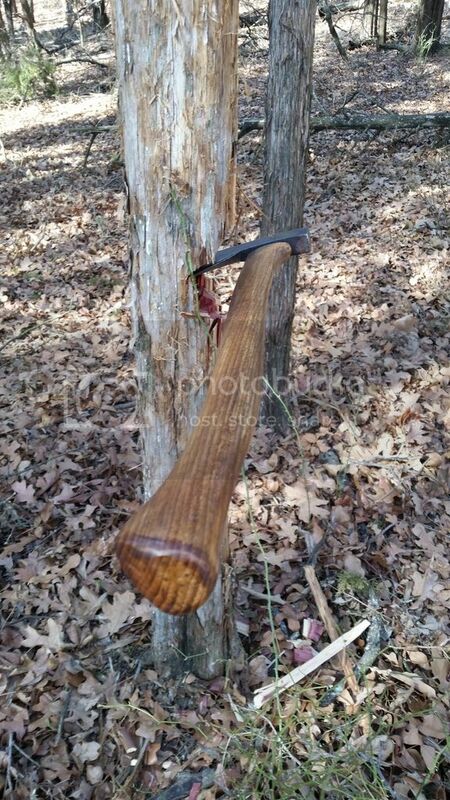 This is a Cold Steel Trail Boss I got from @Forestree on one of our last outings. 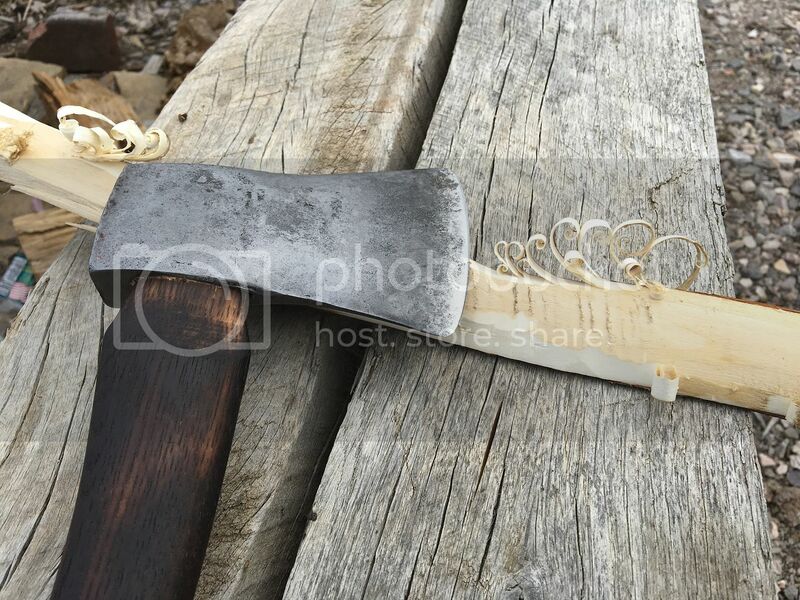 He found it at a camp site and put it with his arsenal of throwing axes. When the handle finally broke, he gave it to me so I could complete this class. Thanks Forestree! Also, big milestone...this is my final elective class! 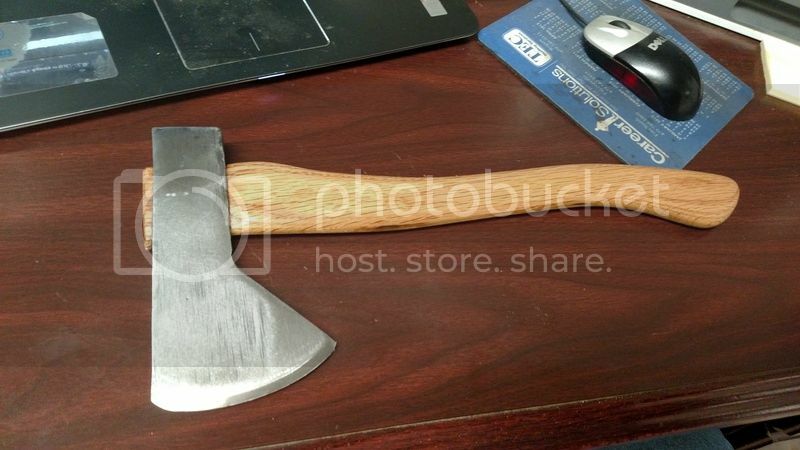 Here is the ax head with the new hickory handle. Me sanding the head down to fit in the ax. 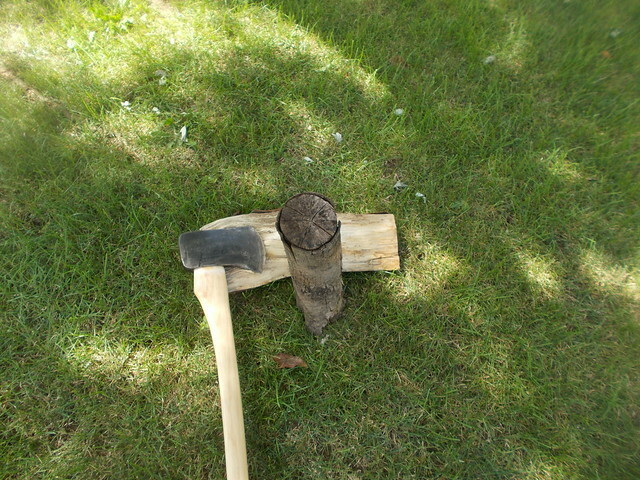 Tapping the stump to push the head through the ax. 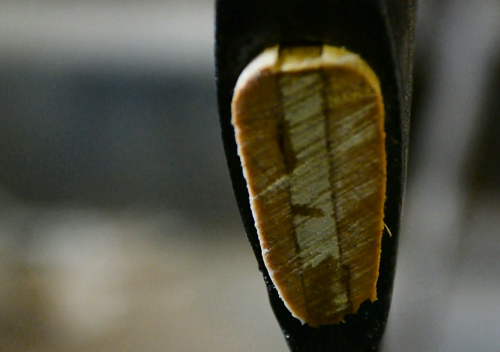 Tapping in the oiled wedge. 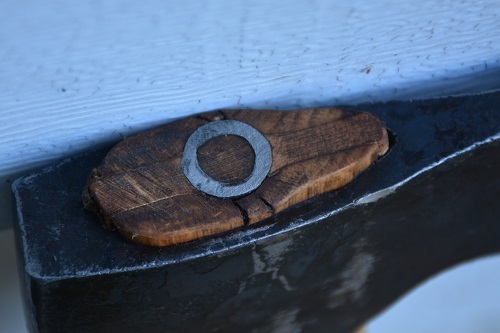 I put a coat of BLO on the handle. I may go back and add another coat if necessary. 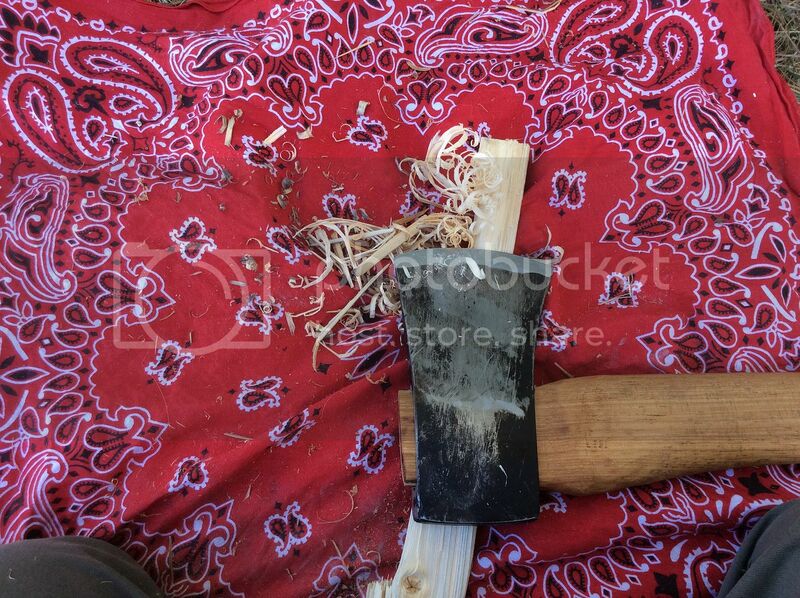 The Trail Boss slices through firewood like a....boss. Seeker, AK Adventurer, Forestree and 1 other person like this. Here is a little one pound true temper hatchet Not the best at chopping but this thing splits like crazy. OMRebel, AK Adventurer and Sgt. Mac like this. Here's an axe I just hung. 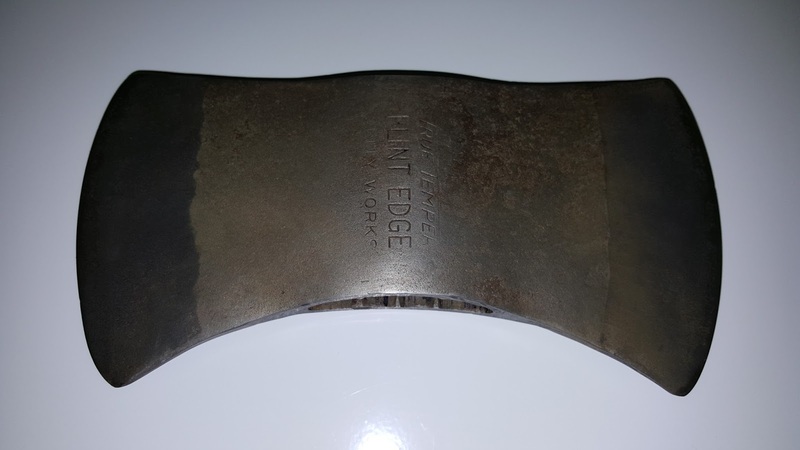 I got this neat middle sized broad axe head second hand. Always wanted one of these for roughing out carvings. I decided to put it on a one handed handle because I picture using this that way on a chopping block. Its an oldie, but has no maker's mark. If anybody out there knows anything about this one, I'd sure like to know. It is a very solid piece. A couple things I like about it on the flat side: 1) By the red marker you can see a line between the lighter hardened steel of the bit and the darker softer steel of the rest. 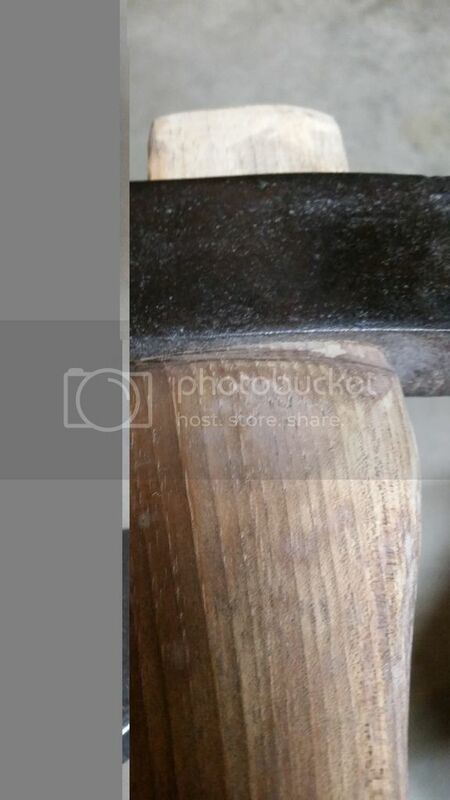 I see this in older tools and it seems to indicate a well made tool to me 2) by the pencil, you can see an interesting mark from a forge weld where it seems the steel was wrapped around the eye and forge welded together. Nice old method and very neatly done. 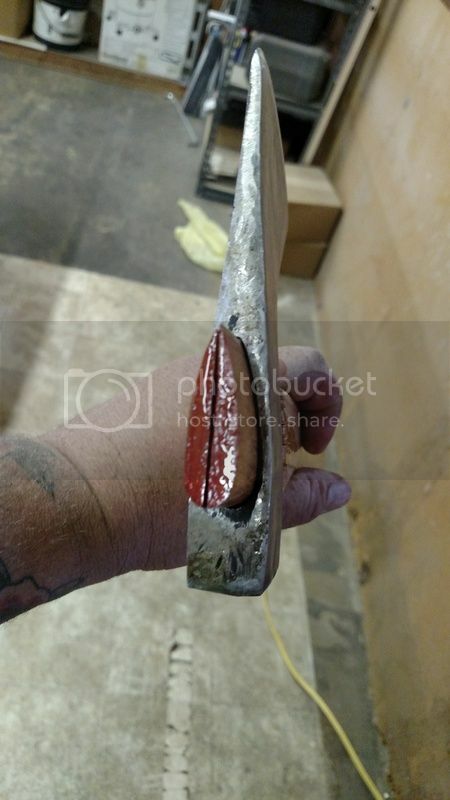 I shaped a wedge out of a scrap of purpleheart. After some test fitting, I oiled the wedge and set it in place. I'm a lefty, so I mounted this one that way. And set in in place with a heavy rawhide mallet. This picture is after I trimmed the wedge flush. I don't like to use the metal cross wedges. 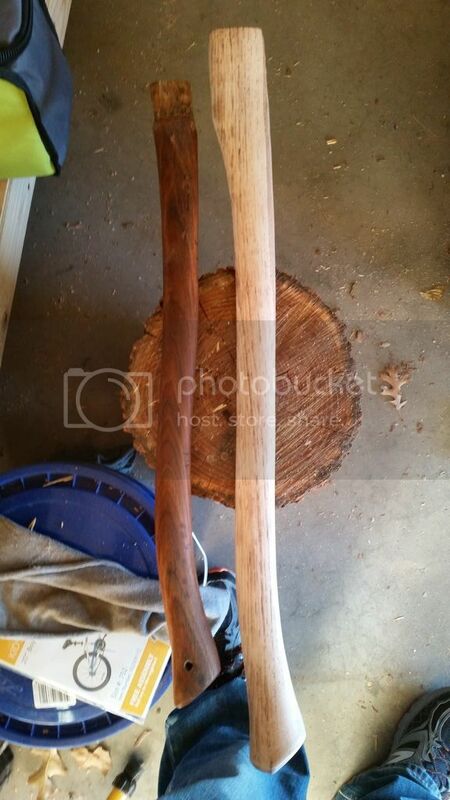 I learned from an experienced blacksmith that these just destroy the handles. 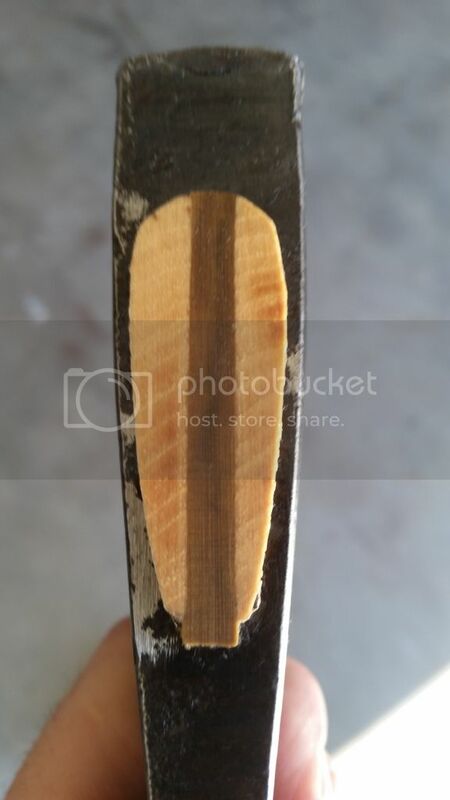 You can reset or replace a wooden wedge if it comes loose, but if it has the metal cross wedge and starts to come loose, the handle is basically not usable anymore because the cross wedge splits the wood. Tom Eickenberg, Not Sure, americanstrat98 and 5 others like this. 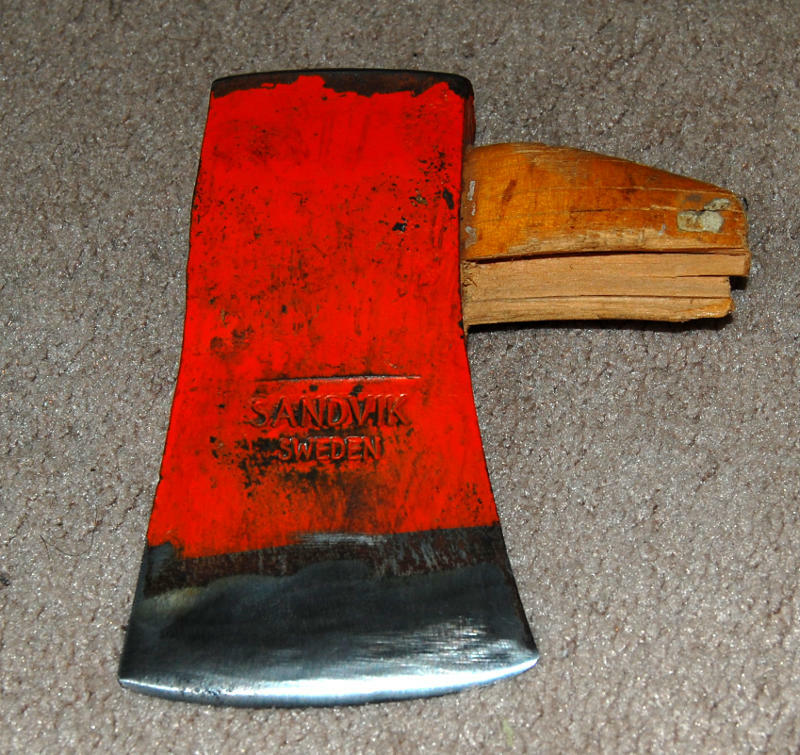 My dad gave me this small axe head this weekend for this lesson.. I cleaned it up and for the life of me couldn't find a handle to fit it.. so I decided to make one.. or try.. so I found a hardwood pallet board..
this took the longest.. I split the neck with a hand saw and drove the axe head on tight, oiled the wedge and sent her home! the neck held the head pritty true I smoothed it up a little with a flapper wheel on a grinder.. handle needs smoothed and some b.l.o but all in all turned out good I think. Hope this passes for hafting and axe! Chopping picture below! Tom Eickenberg, OMRebel, AK Adventurer and 2 others like this. 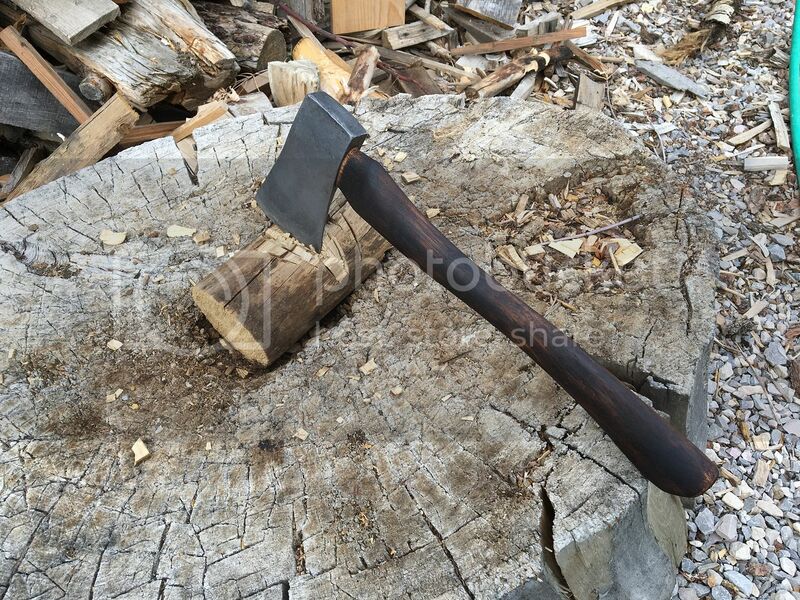 Does that axe have a chisel type grind? 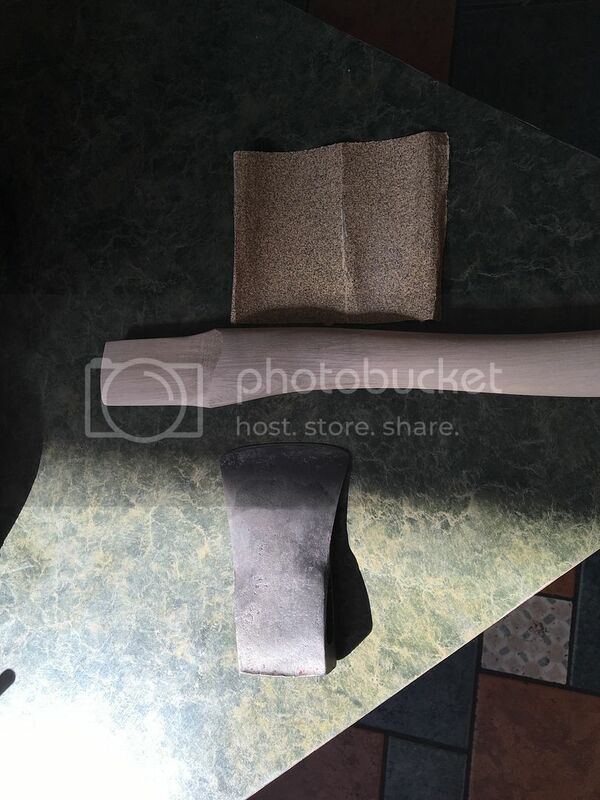 Yes, it is a broad axe, so it is flat on one side and has a single bevel on the other side. 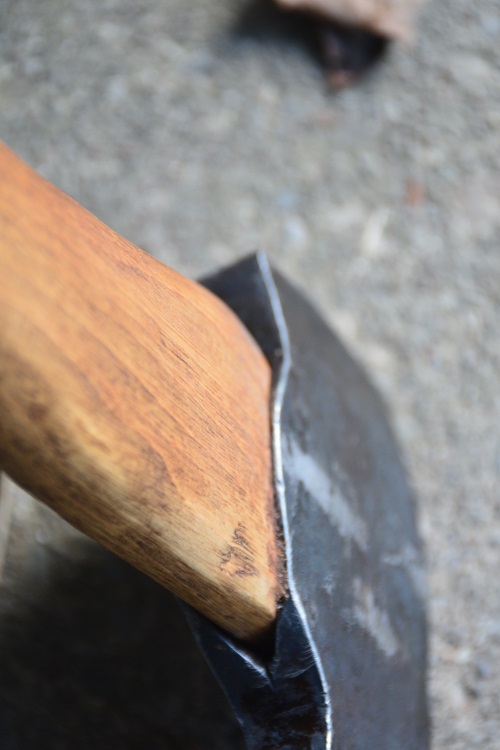 It is used for making a flat side on a log using the flat side of the axe against the wood. Cool thanks, I have seen videos of people using them but never in real life. They look fun. 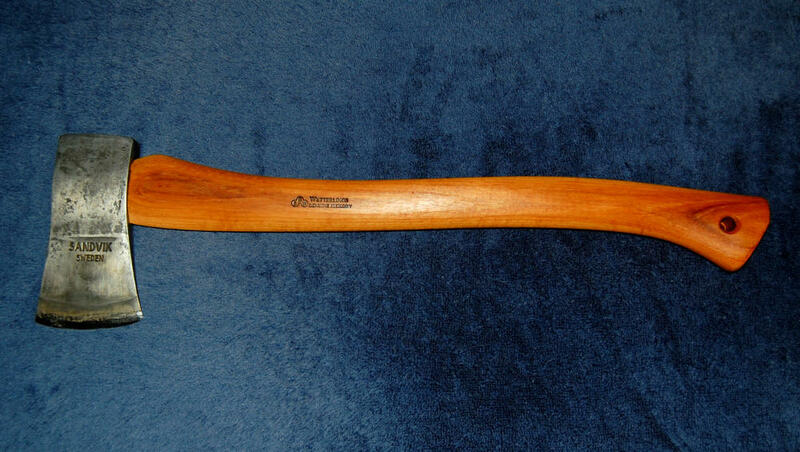 Before Christmas, I purchased a exceptionally good condition Kelly True Temper cruiser axe head on eBay. 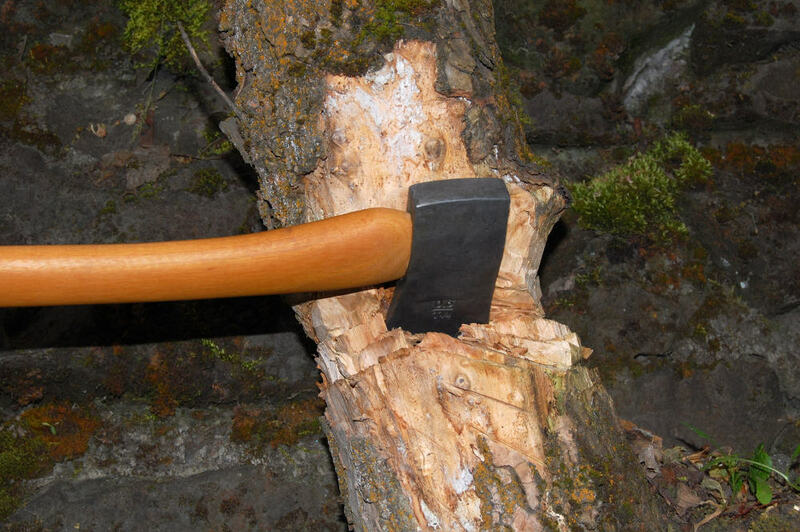 While it seems very unlikely, the bits of the axe do not look as if they have ever been sharpened. 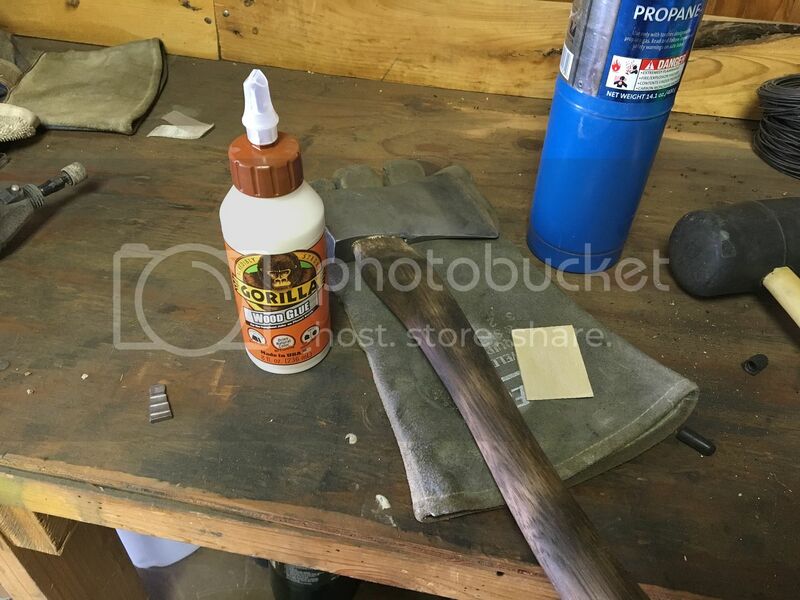 As you can tell in the image below, the axe was soaked in vinegar but there must have just been some light surface rust which required it as there are no pits in the metal. 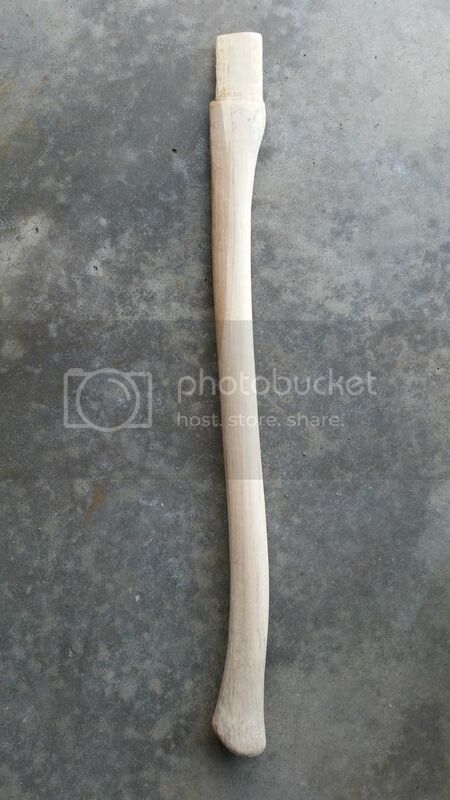 I purchased a 28" white hickory handle from Beaver Tooth Handle Co. 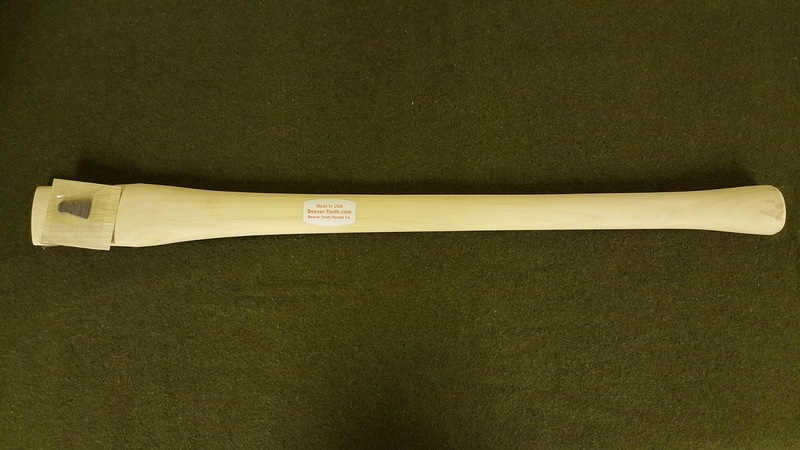 The handle is produced rather well but with pretty good grain orientation. The cut in the top for the wedge is just a little off center but it should not be an issue with the functionality of the axe. 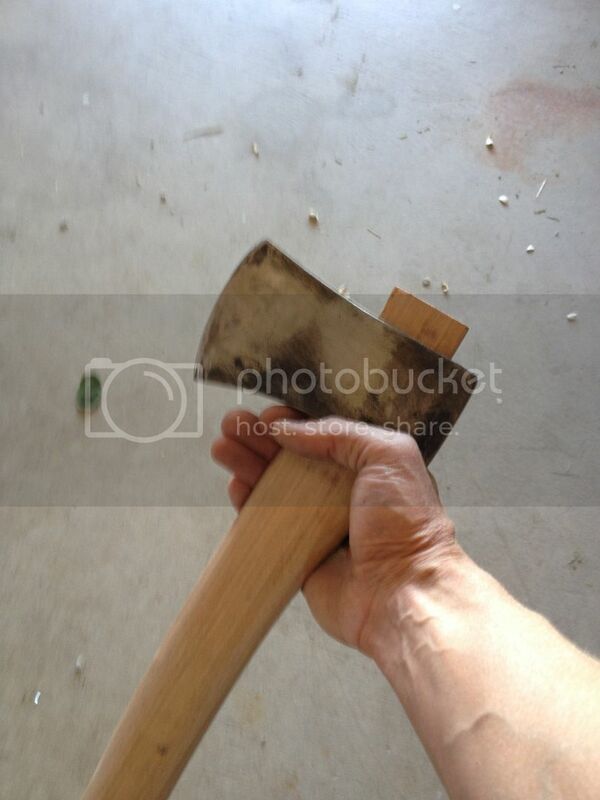 There was a considerable amount of wood removal required to fit the handle to the head. 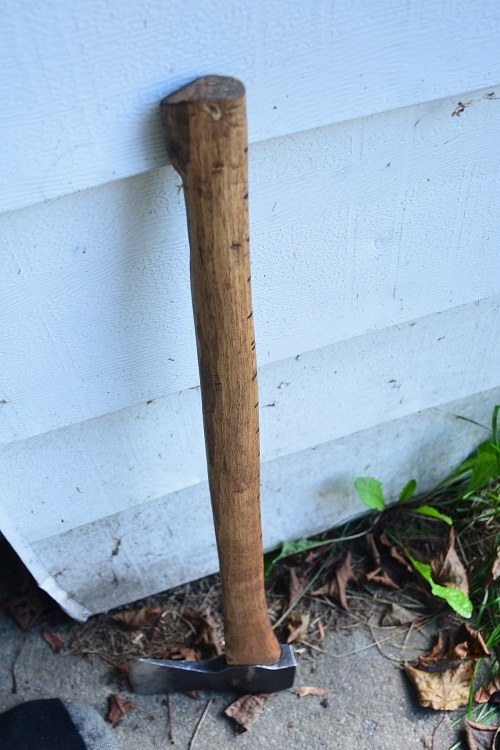 I trimmed it just enough to seat the head and have about 3/16" of the handle stick above the top of the head. This should leave plenty of handle to drop the head down and refit it if I ever have issues with the head getting loose. 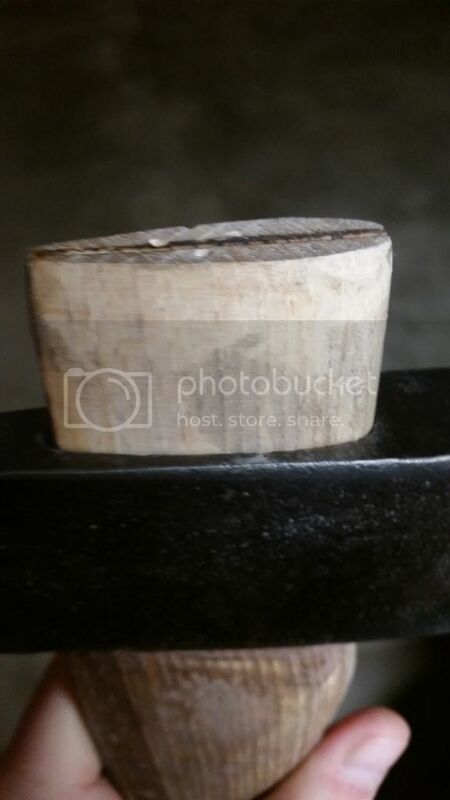 The image below is of the head after seating it on the handle. There were small curls of handle rolling up around all sides which points to a very tight fit which it great. 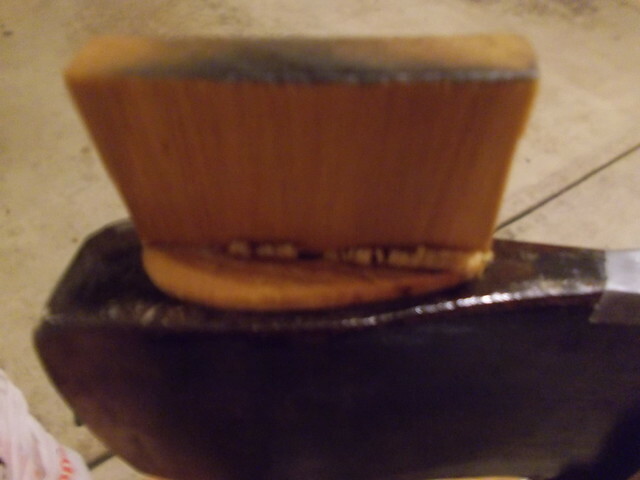 I soaked the wedge in boiled linseed oil and then worked it into place. I made marks on it to see how far I was able to seat it and so that I would know when it was no longer moving. I was able to put it about 1 1/8" into the head which is quite good. You can see it was even starting to curl which is another sight of a very tight fit. 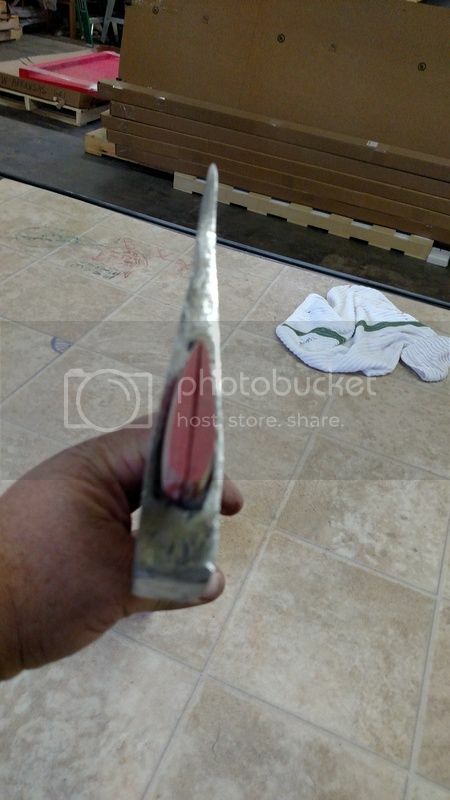 I cut off the excess wedge and left about 3/16" of the handle out the top. I think the swell of the wood out the top of the head helps a little with head retention. I'm undecided on the use of a metal wedge. At this point, I'm going to leave it out. If it begins to get loose, I'll add one. This is the final product after several coats of boiled linseed oil. Additionally, I worked on the head with some fine steel wood and WD-40 to get the carbon residue off from the previous owner's vinegar bath. 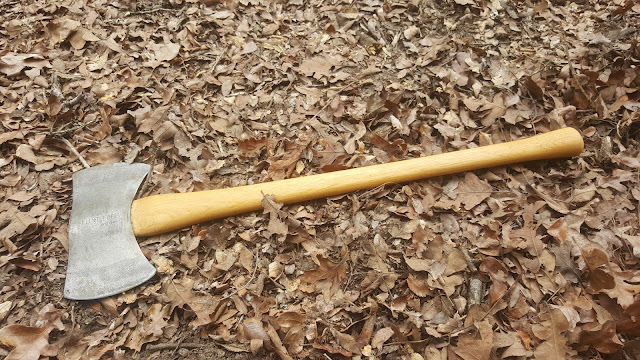 The axe is now complete and ready for use! 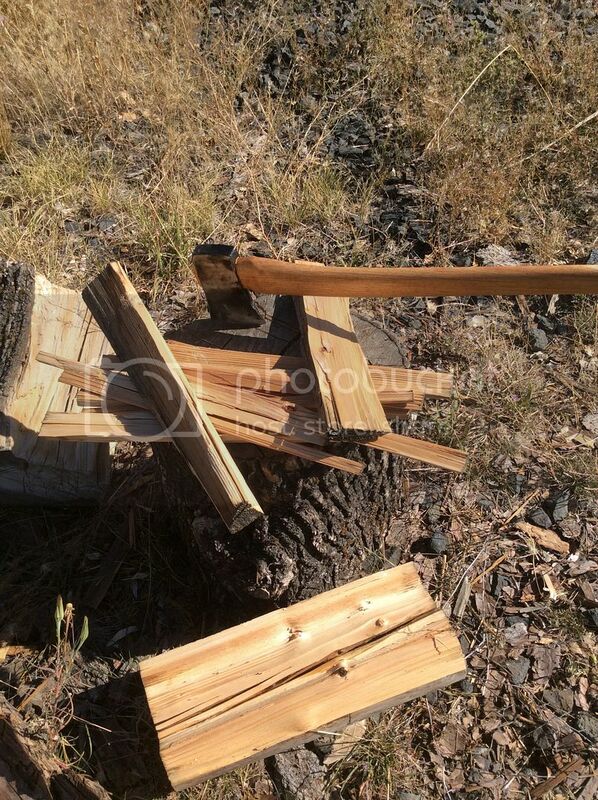 Put the axe to use shortly thereafter by downing a dead tree which is about 9" in diameter. Tom Eickenberg, Sgt. Mac, theNATIVEONE8 and 1 other person like this. This is something I've never done properly before and have been eager to put this new found skill to work. 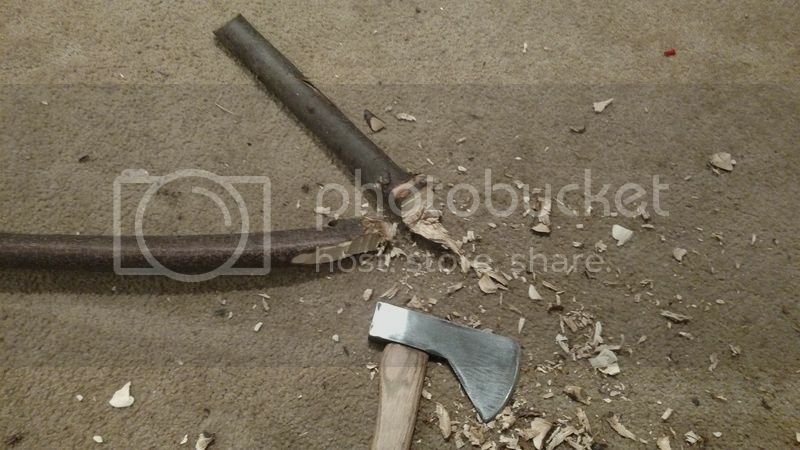 I watched youtube videos years ago about hafting an axe but never had an old axe to haft. So, two days ago I found a BlueGrass Double Bit laying around in the maintenance building at the place I work sitting in a corner feeling neglected next to a bunch of Pulaskis and Fire rakes. It definitely has seen better days. After I removed some of the tape. It was hiding a potential catastrophic failure for the next handler. Removed the old handle and cleaned up the surface rust leaving the patina. 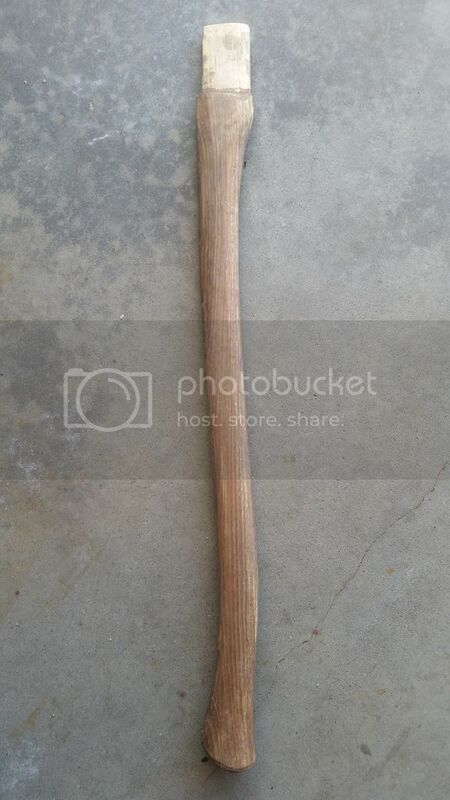 Purchased a 36" double bit hickory axe handle with very good straight grain from my local hardware store. On the company's dime of course. Fitted the handle with a draw shave, rasp, and sand paper and removed the lacquer from the handle...BLO once completed. 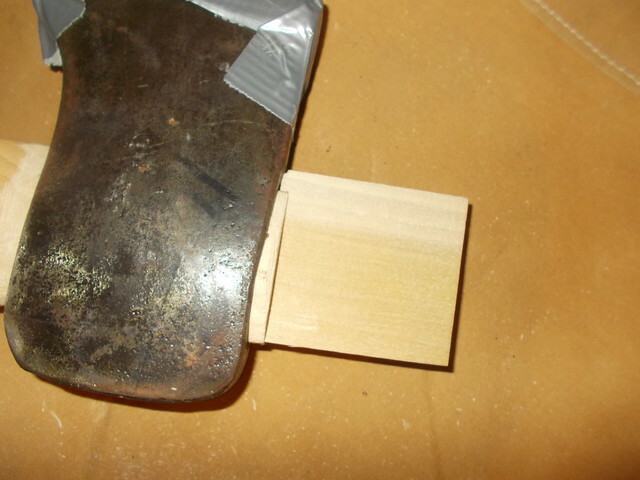 I seated the head on the handle, fit the wedge and removed the excess. Treated the wedge and handle with a healthy serving of BLO. 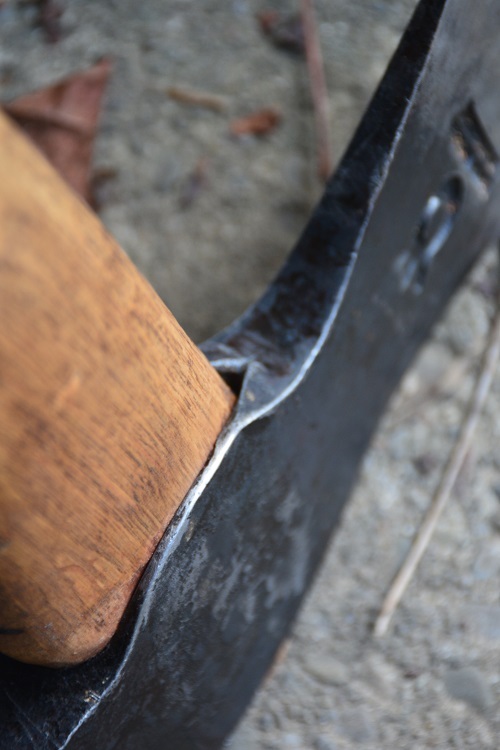 Sharpened the axe by hand on one side and by mechanical means on the other. Wanted to see which was better. It might not be perfect but its definitely better than it was. Cut through a fallen beech in my side yard. All in all I learned quite a bit in this process. 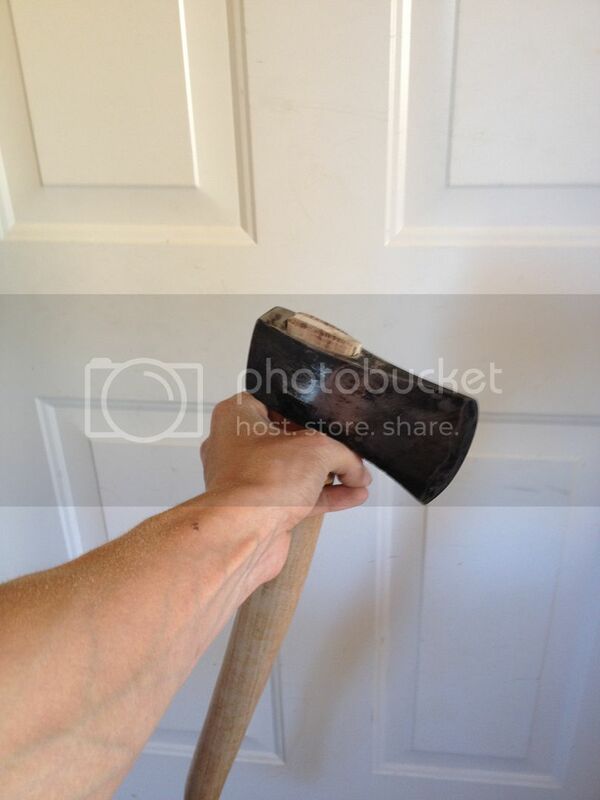 Store bought handles are one size fits all and it took quite a bit of fitting to get the handle to fit. I took a little too much, I believe, from the sides and next time will try and do better. The axe didn't budge, however, from its location but in reality I only cut one small diameter tree with its new handle. I also used some newly twisted jute twine I made using a rope twister and whipped a handle guard. It was fun and looking forward to my next. Here we go, another lesson for bushclass! Its been a little while, but Im back. 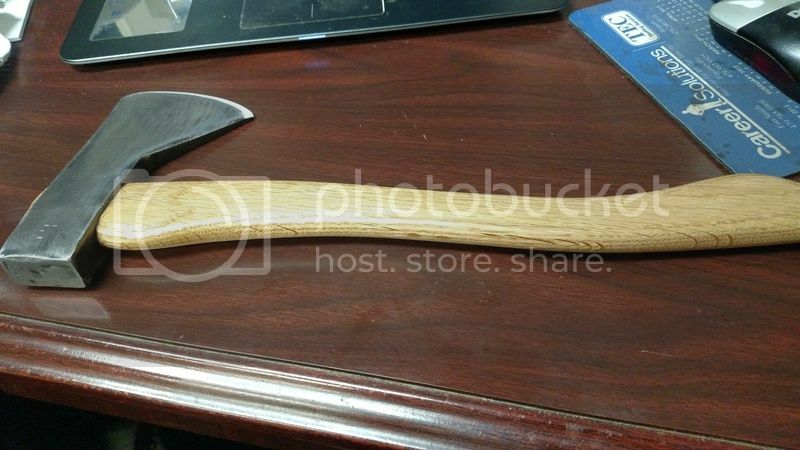 I got an awesome carpenters hatchet head from a member here. 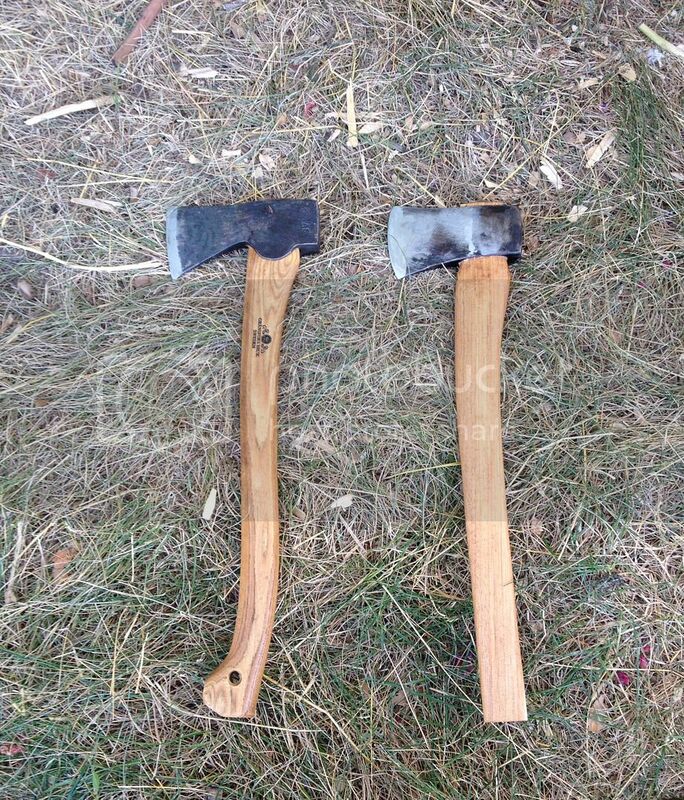 Its going to make a perfect pack hatchet. I first did some shaping, getting it to fit. 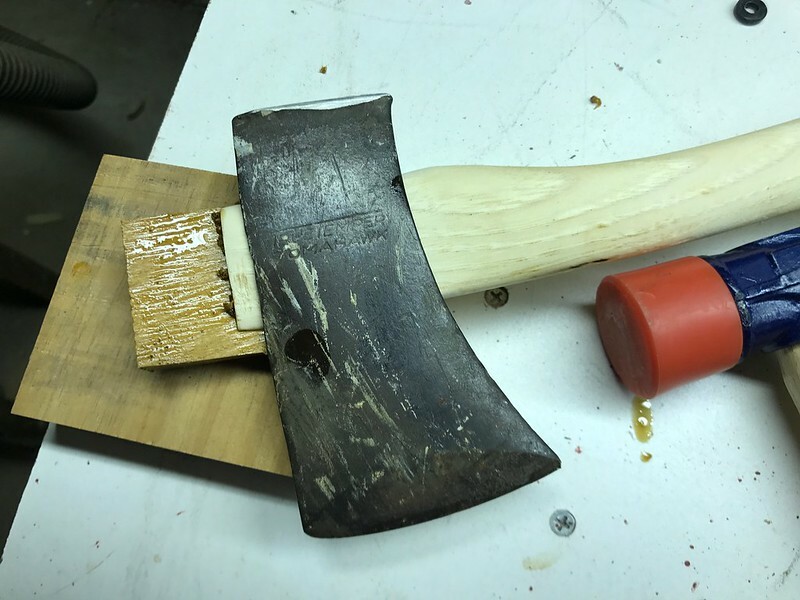 I soaked the wedge in some blo and just worked slowly with the mora and the rasp. 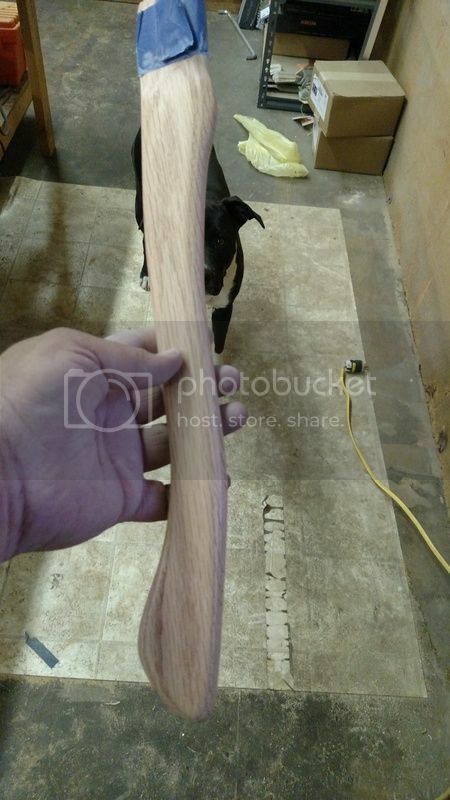 I shaped and got a rough outline on the handle. I went down until the handle filled the eye nicely. I had the wedge soaking and pounded it home. I didnt take anything off the top of the handle yet. I might, Im not sure at the moment. I split some wood and chopped thru a green aspen. The head didnt move at all. It was fun, and nice to post something again. Thanks for looking! 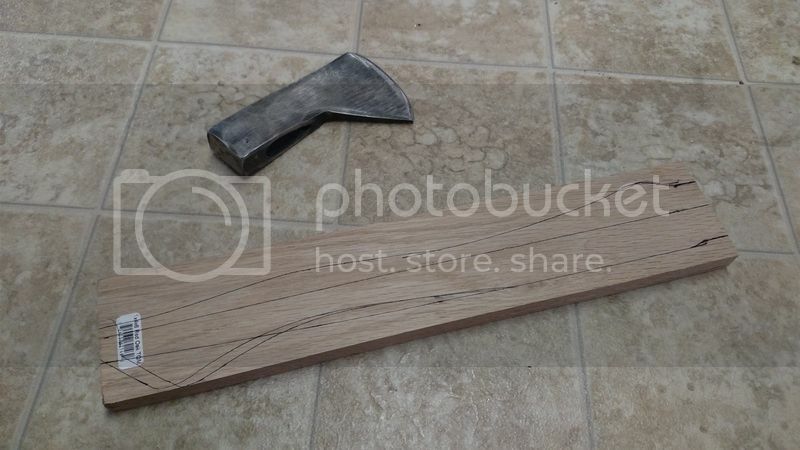 I had an old axe of my Dad's that I could restore and use for this project. The shiny axe and it's future mate. Inverted belt sander for the final touches. Final edge ready. Snug fit. 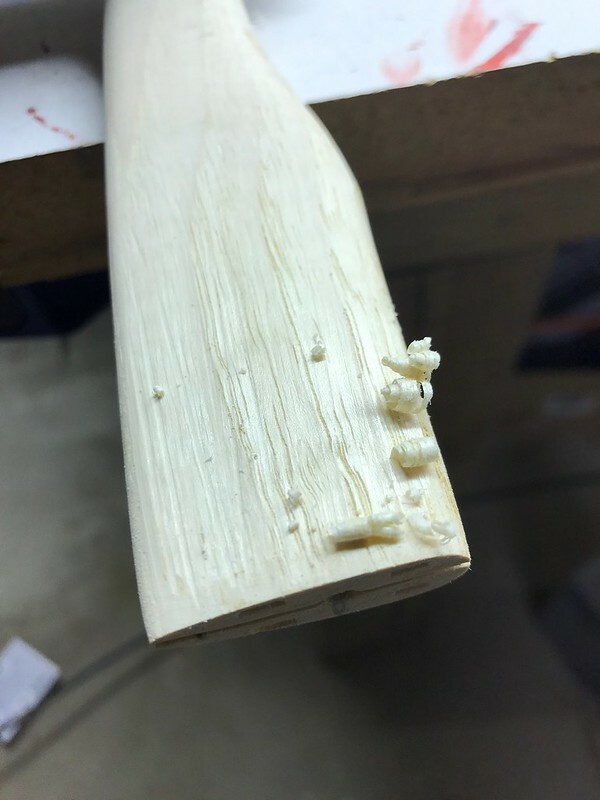 First wedge split while trimming. Family not home to hear me express my shame. A return trip to the big box store and more care yielded a usable wedge. 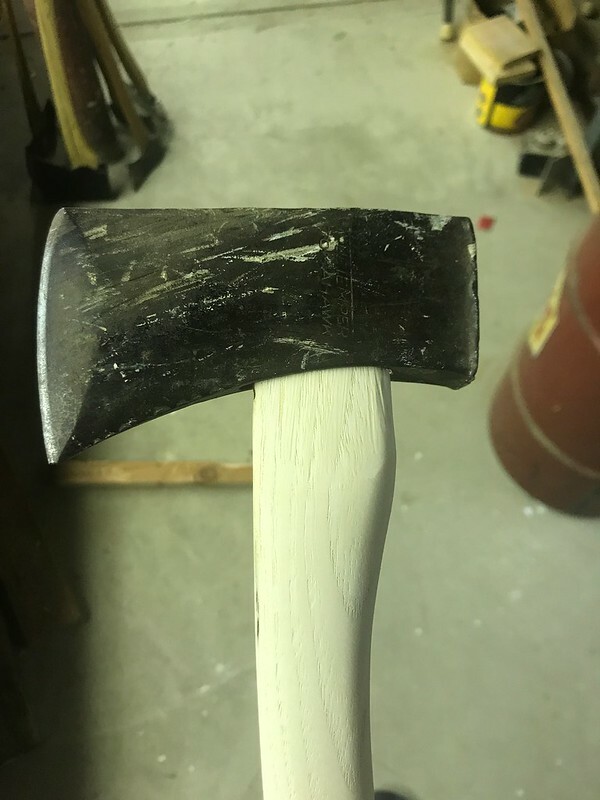 I also spend a fair amount of time in the edged tools subforum, so I posted a detailed write up of my first axe restoration/hanging project. It satisfies the requirements for this lesson. Youcantreadinthedark and notoiletpaperinthewoods like this. This handle never should have been born, it's what I got though. ArmyMacE, Tom Eickenberg and notoiletpaperinthewoods like this. Here’s mine. Some pics are screenshots from the video I have yet to post to YouTube, but will be up shortly. Old hurts bruk hatchet, antique store find. Agdor-fix filled eye. No metal wedge. New Hults bruk 20” handle, carved up and fit to the eye. 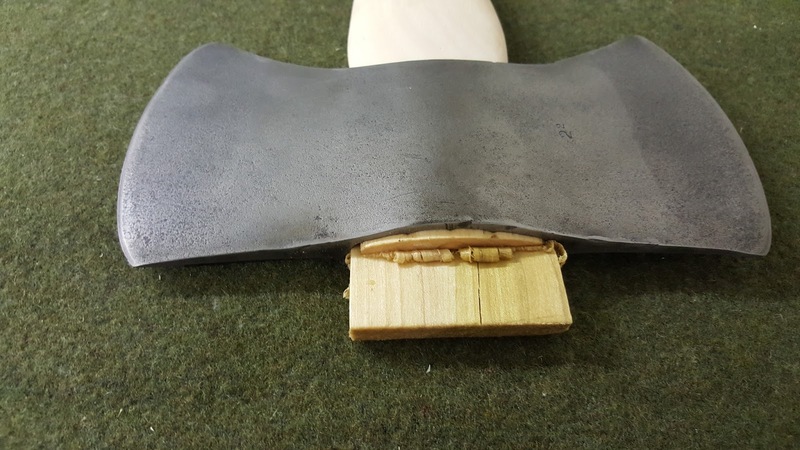 Fitting the wedge, hammered in and excess trimmed off. 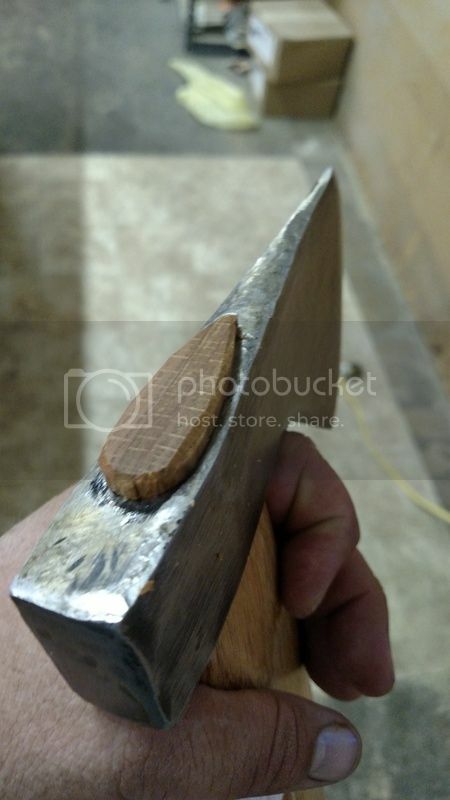 Round wedge hammered as far as possible, then all of the wood and metal sticking out of the eye is trimmed and filed flat. All finished. 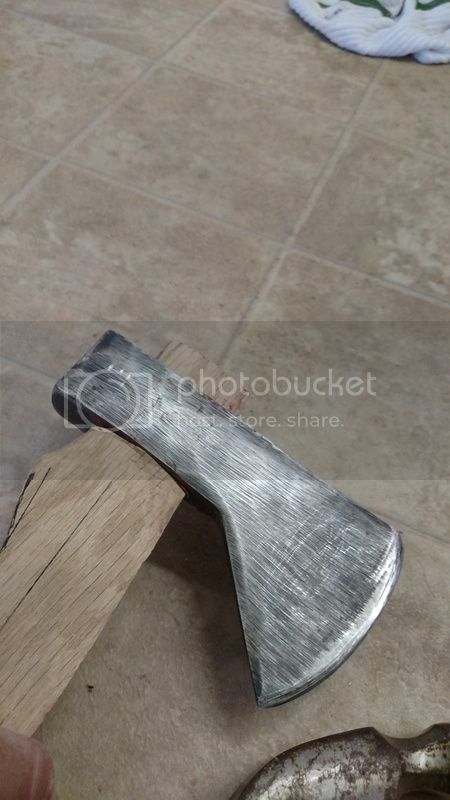 Oiled up the handle and reprofiled the edge, but still needs some polishing work on the head. Other than that it is fully functional. Did this one over the past week. I didnt do any work to the handle itself because i really didnt think it would ever be used. After handling it some, I know I'll have to slim this handle up some. It's too good of a head not to get some use. It's got a good profile and cuts pretty good. 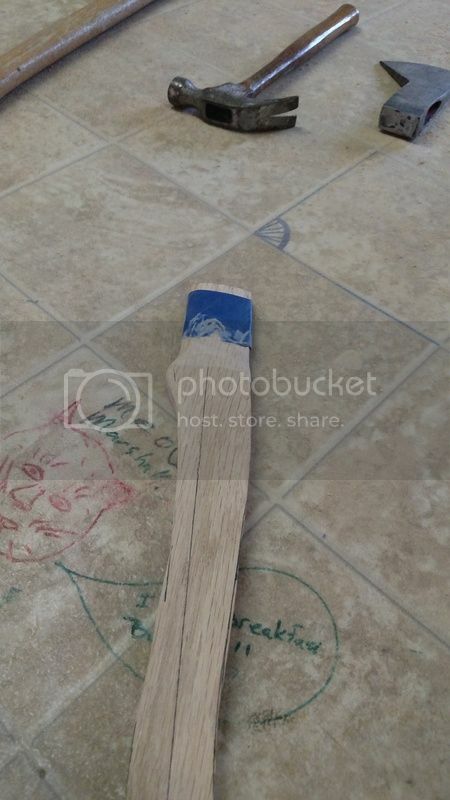 I found this at a yard sale with a cracked handle. The old handle was probably half as thick as the new one. Had to chisel the old split wood out of the eye. Then a vinegar soak to get rid of the rust. I test fit and then shaved some. Little bit of work with the file. It fit nice and snug. Curled up some fine curls as I drove it on. Added the wedge with a spot of wood glue. Drive it in, cut off just proud of flush and added the metal wedge. Piles with boiled linseed. Drilled a hole at the end and added the cord to hang it from.